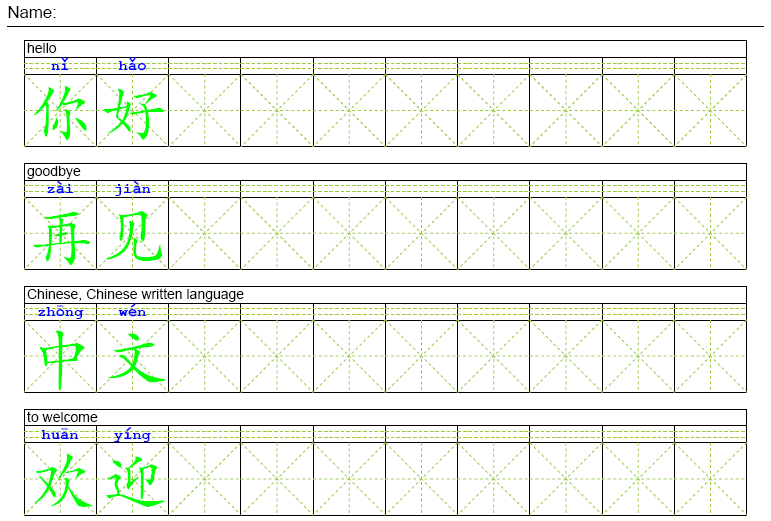 Arch Chinese is a premier Chinese learning system designed from the start specifically for English speakers. 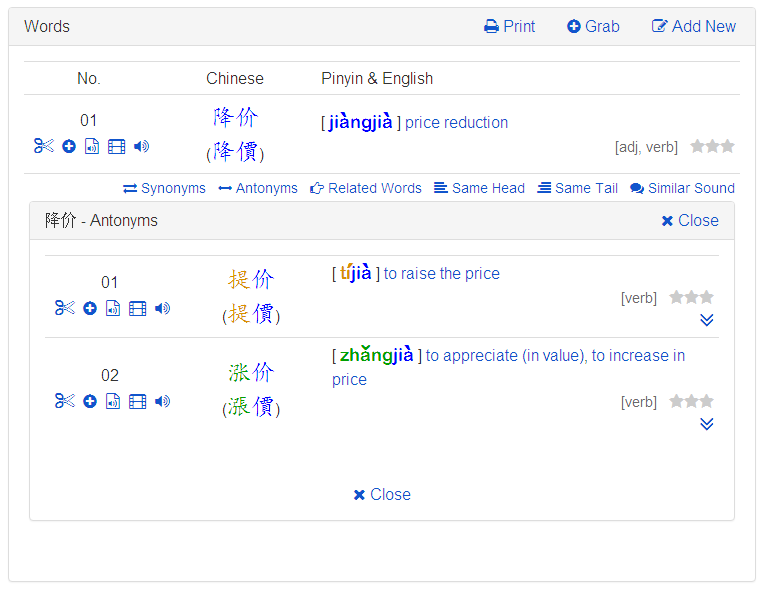 It offers a rich set of features with a slick and easy-to-use user interface. 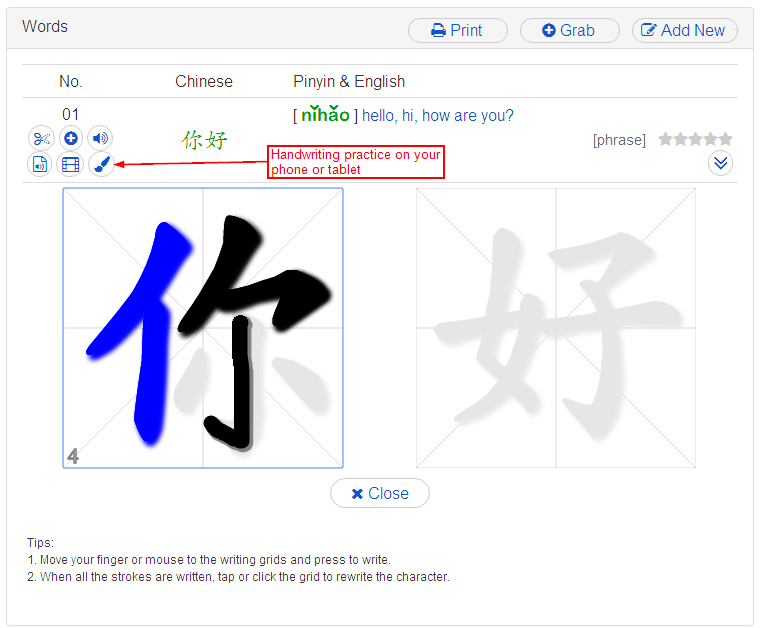 The features of the system are distilled from the user feedback and feature requests from the Chinese learning community. 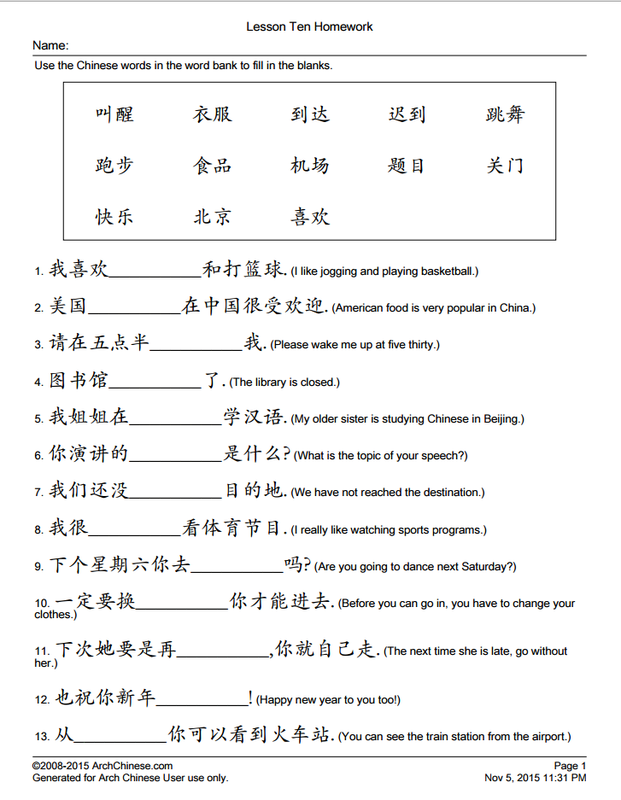 We also consult with Chinese teaching professionals, from preschools to universities, to incorporate their suggestions and ideas into our system. 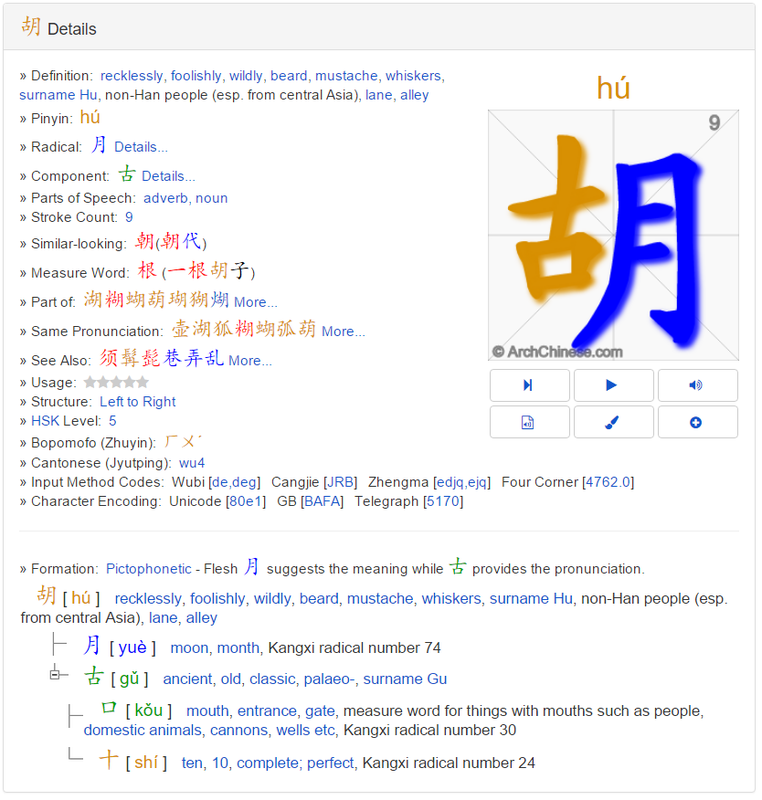 Arch Chinese has become one of the most popular Chinese learning systems in the United States and other English-speaking countries. 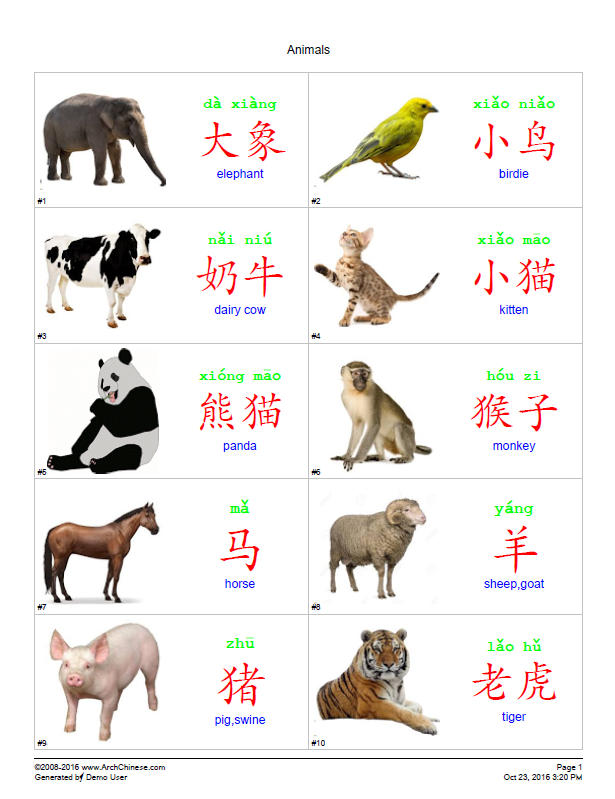 Our ultimate goal is to provide a unique, high-quality learning system to help Chinese language learners from around the world to study Mandarin Chinese in a practical, effective and enjoyable manner. 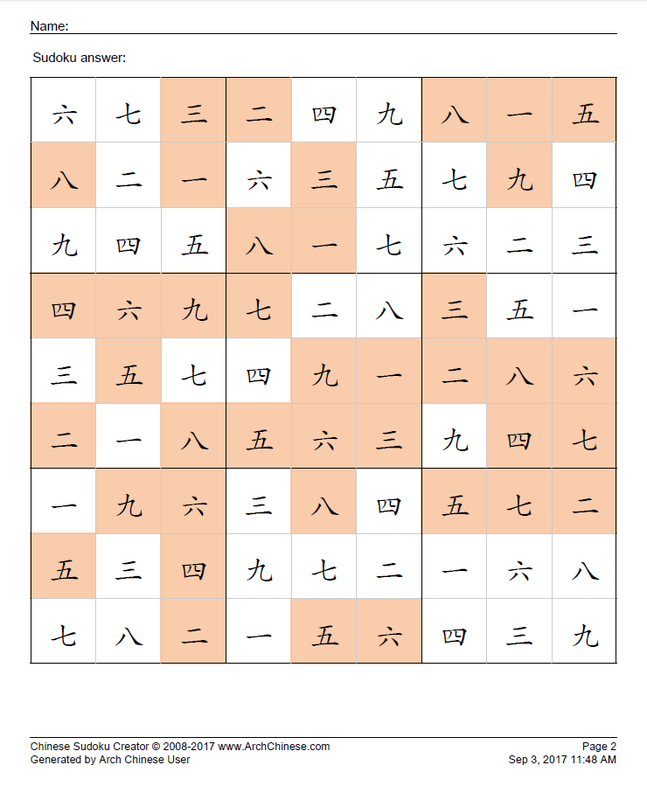 Stroke order animations for ALL Chinese characters defined in the national standard character set of mainland China and 8,000 frequently-used characters in the traditional Chinese character set, which is used in Taiwan and Hong Kong. 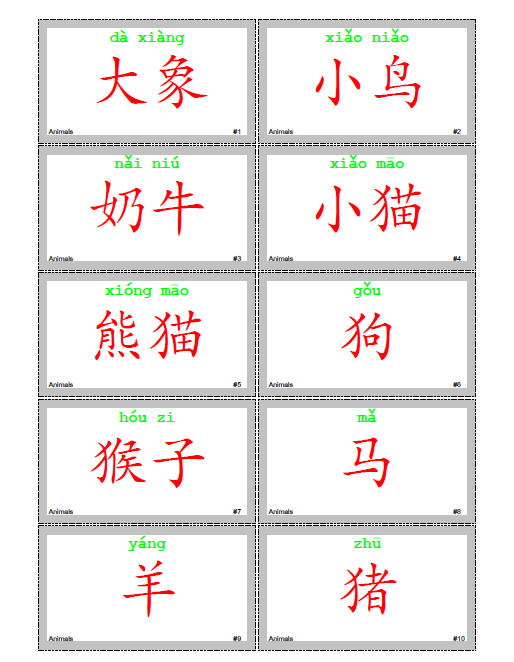 High quality, native-speaker recordings for every character, every stroke of the characters, every word (character compound), and every example sentence in the system! 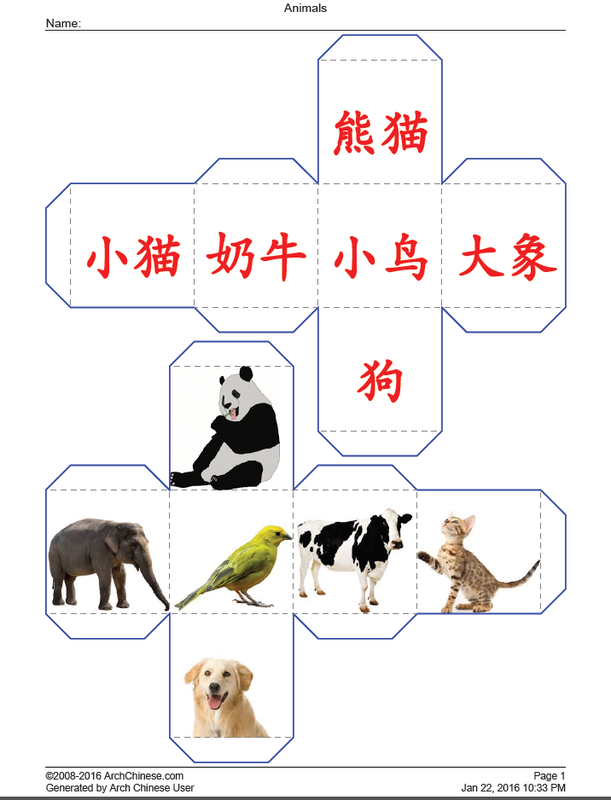 We strongly believe, for learning a new language, the learners should listen to authentic, human voices, not machine-generated or synthetic voices. 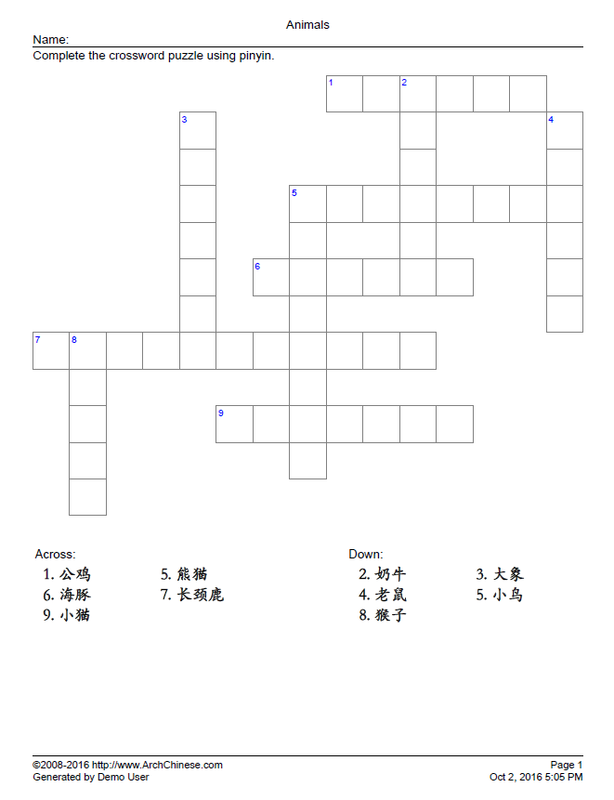 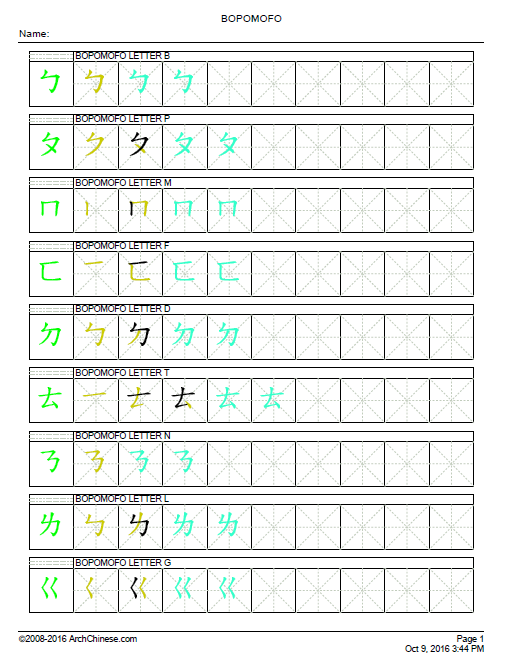 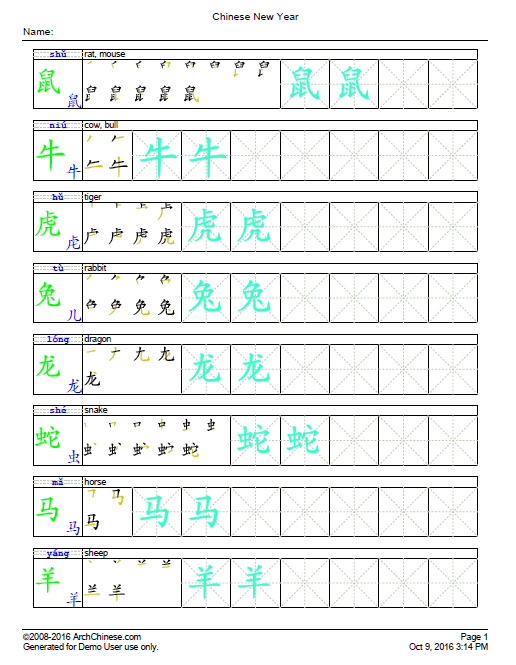 Generating character writing worksheets with stroke sequences, radicals, English definitions and Pinyin in PDF format for offline handwriting practice. 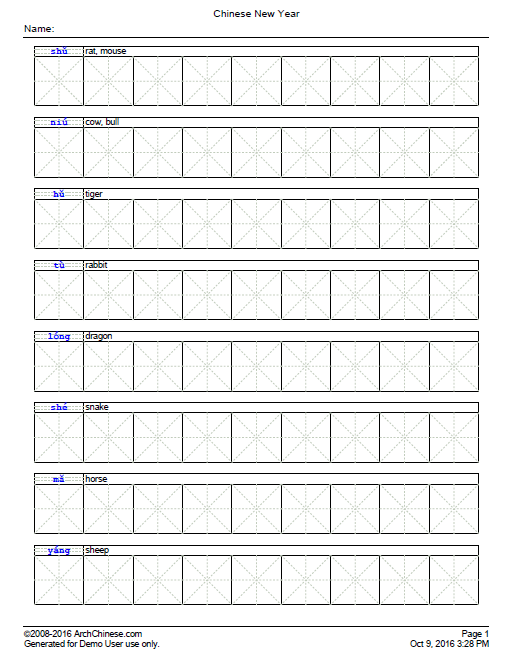 With one mouse click, you can generate the worksheets for more than 100 characters at a time instantly. 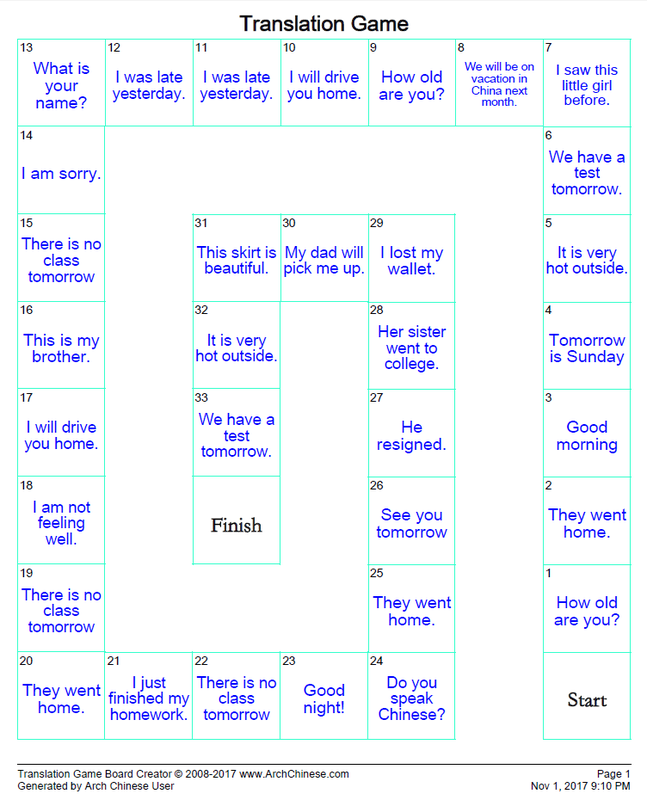 The worksheets are highly customizable. 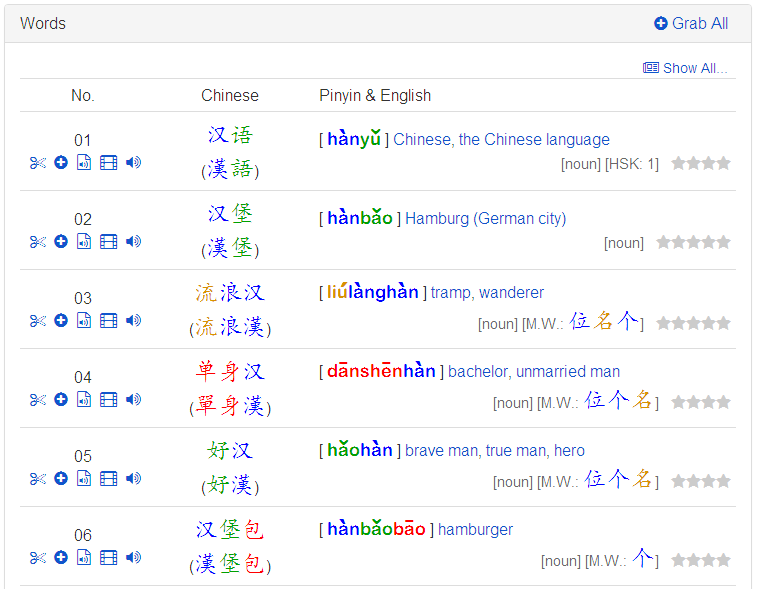 You can provide your own definitions in French, Spanish, German, or any language you prefer. 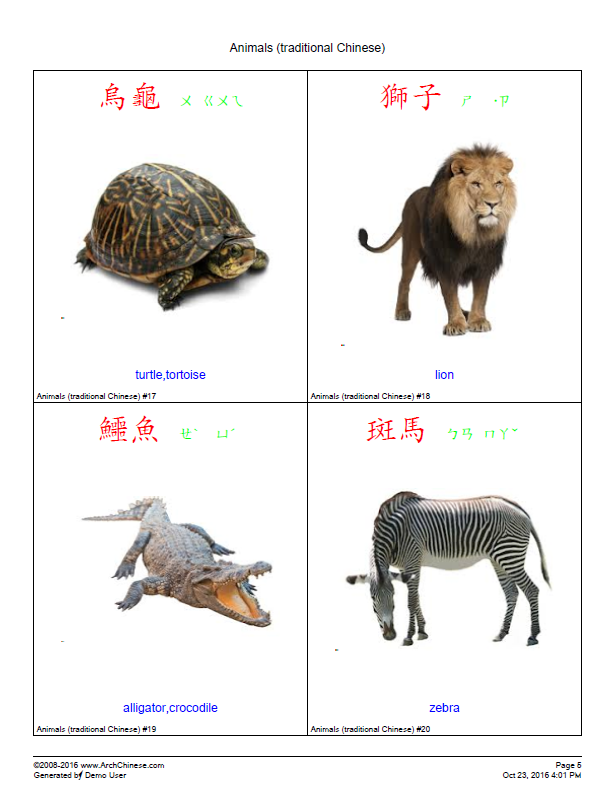 It is great for Chinese language teachers and parents to create Mandarin teaching and learning materials. 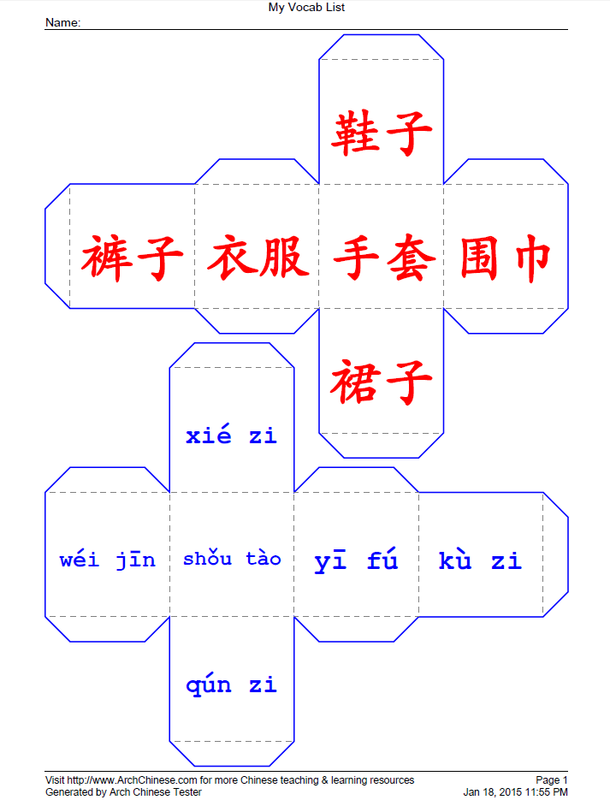 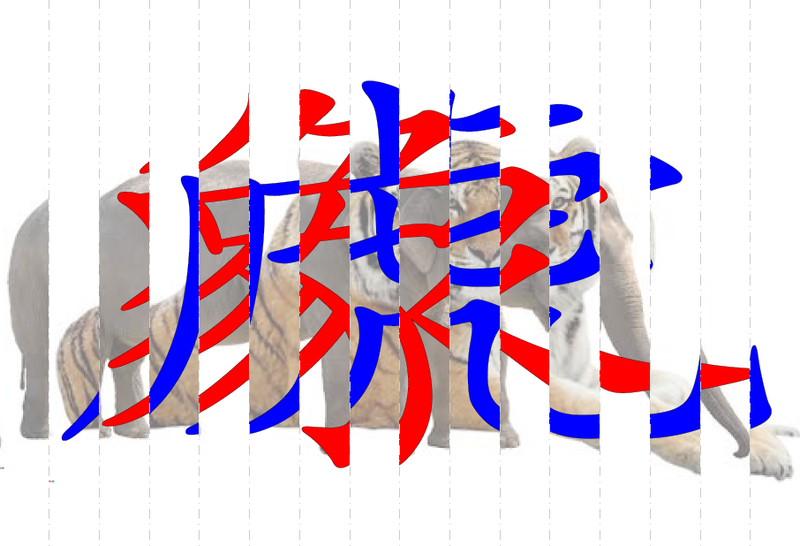 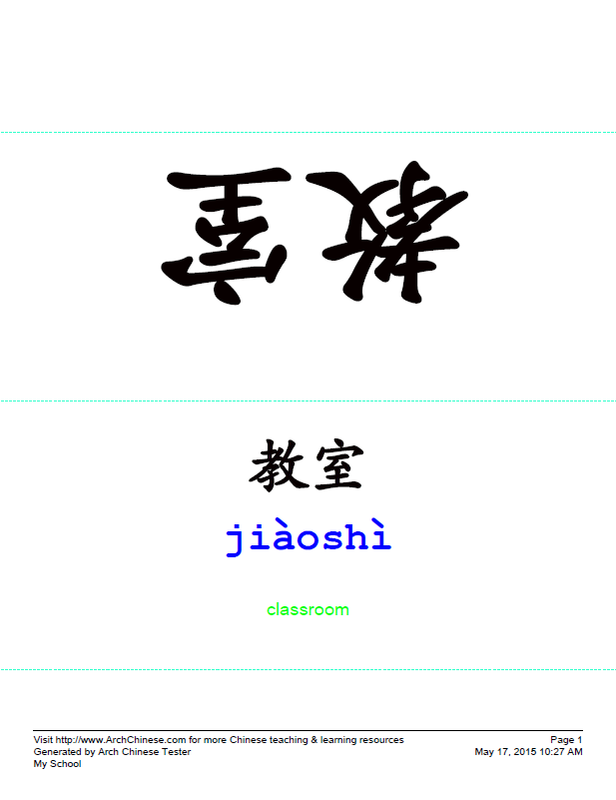 Creating and printing Chinese character and word flashcards for offline study. 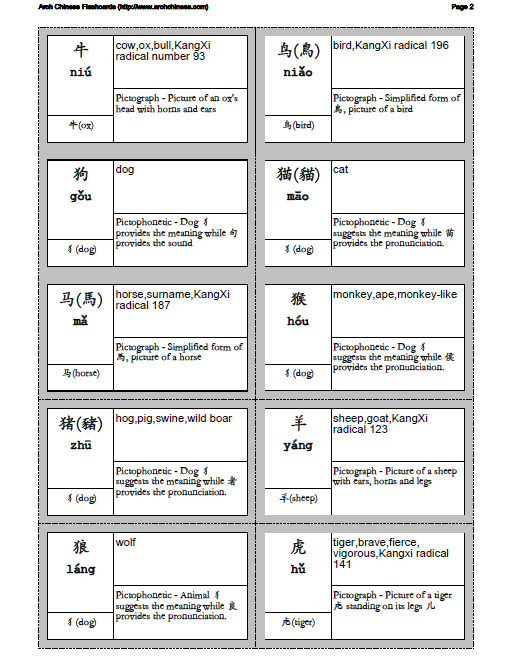 Looking up characters, words and example sentences using our uniquely-designed Chinese-English dictionary. 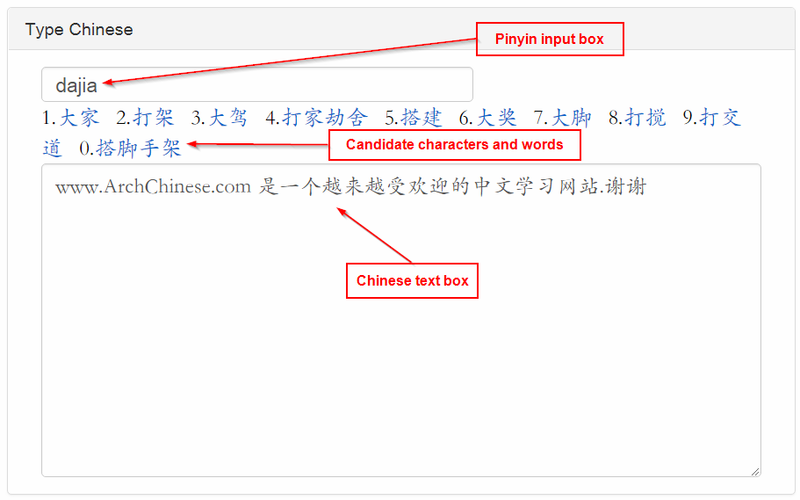 You can search by fuzzy Pinyin (Pinyin without tones), Pinyin with tone numbers, Pinyin with tone marks,Chinese Pinyin Table, Cantonese Jyutping pronunciation,Chinese character radicals, English words, English phrases, English sentences, English sentence fragments, Chinese characters, Chinese phrases or Chinese sentence fragments. 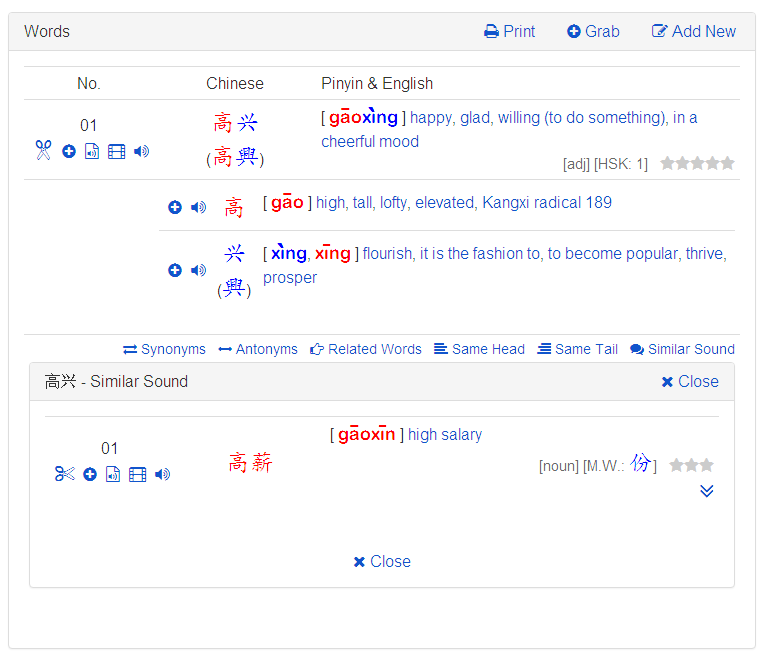 Furthermore, you can mix English, Chinese character or phrase and Pinyin in your search queries. 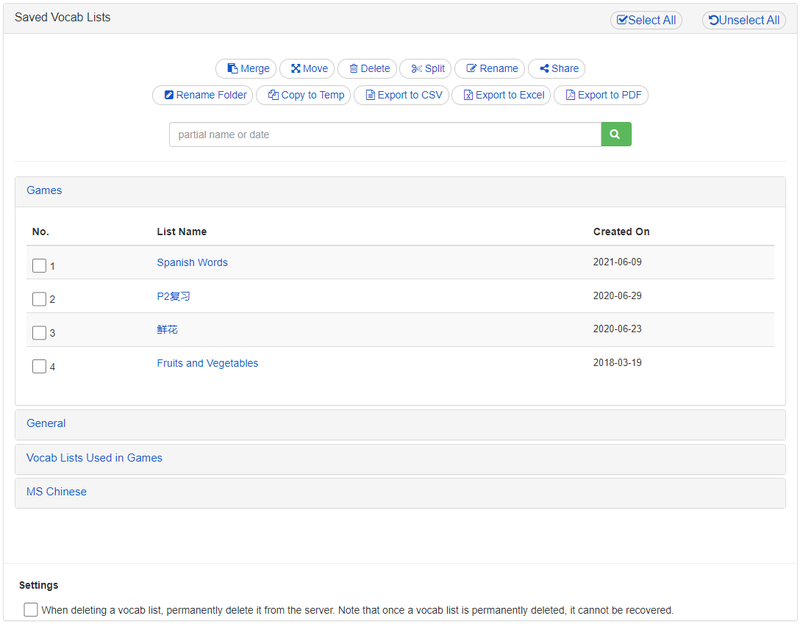 For the part you are not sure, you can even simply use a wildcard in your search query. 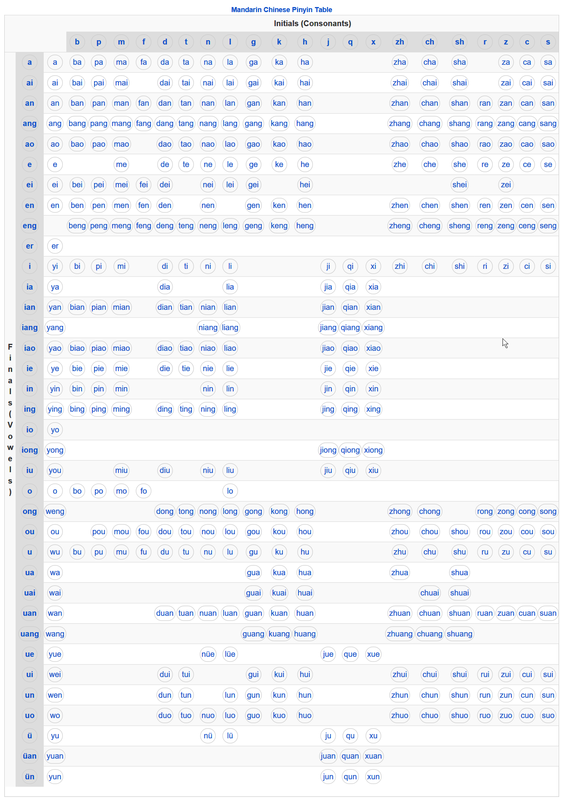 Search results are ordered by usage frequency and complexity. 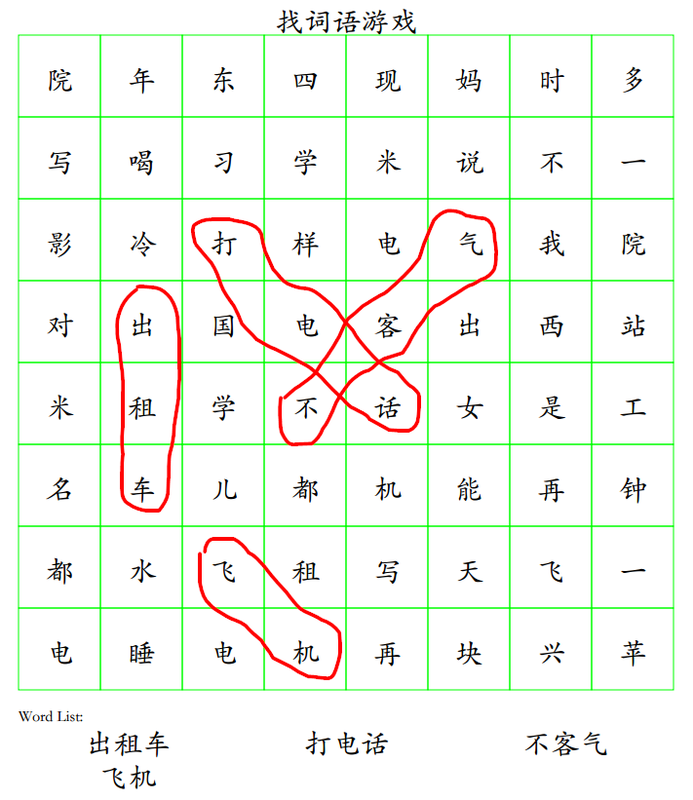 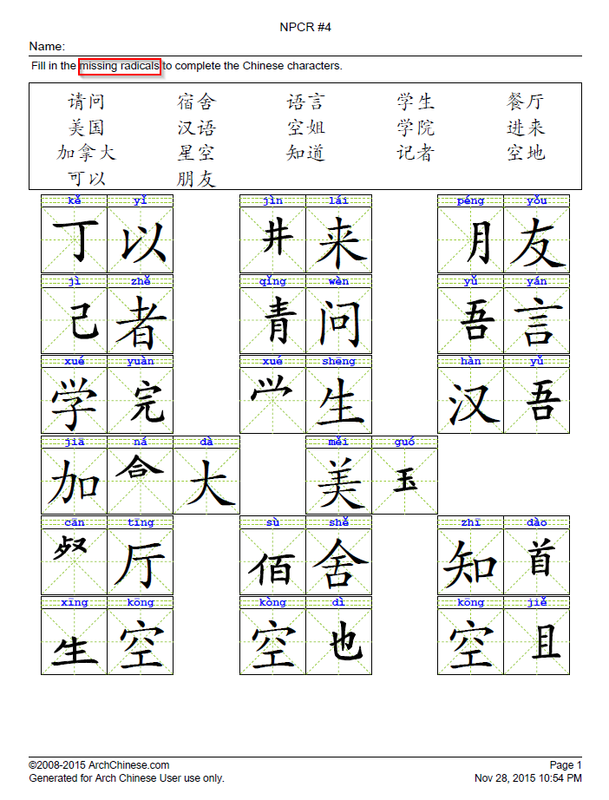 Character formation and etymology information for all Chinese characters. 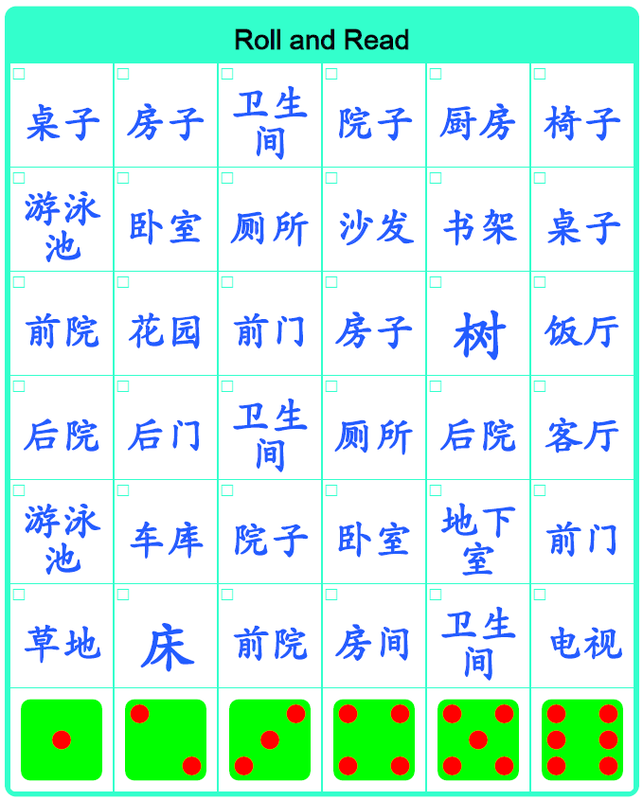 For a pictophonetic character, the system indicates which component provides the sound and which component suggests the meaning. 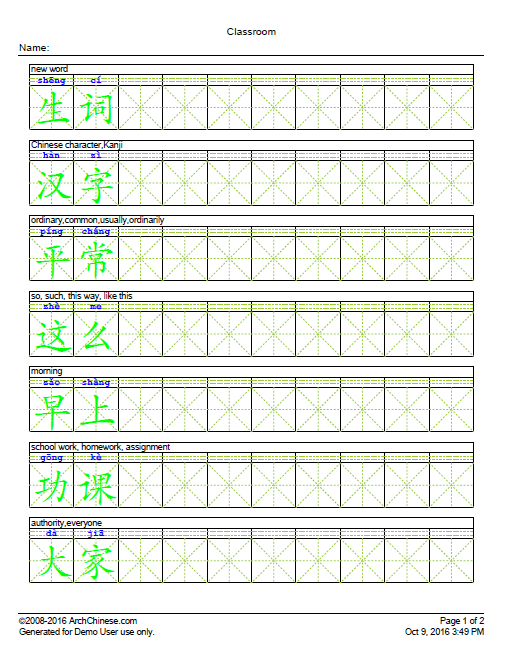 Using our Chinese worksheet maker to generate Chinese word worksheets with character details, including stroke sequences, radicals, and character structure information. 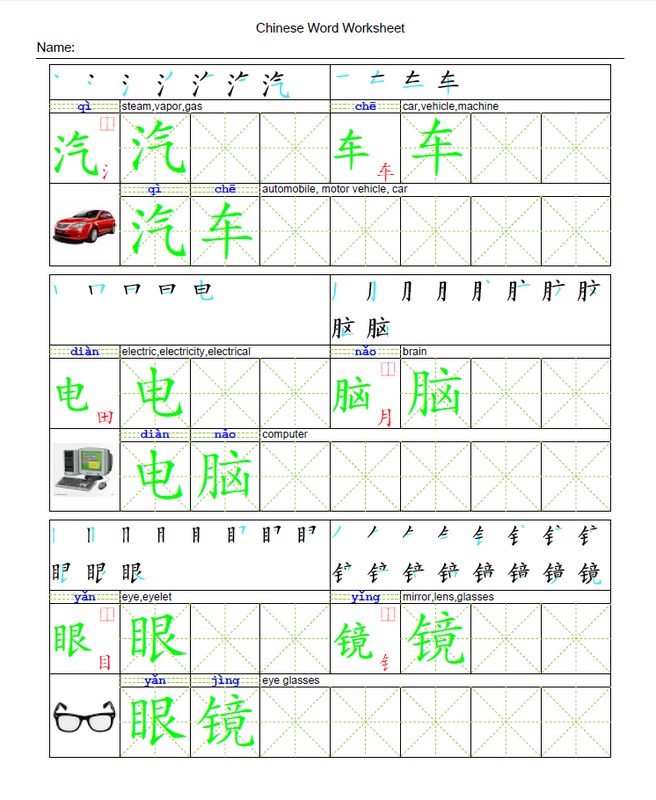 Chinese students can use the worksheets to practice Chinese words and individual characters at the same time. 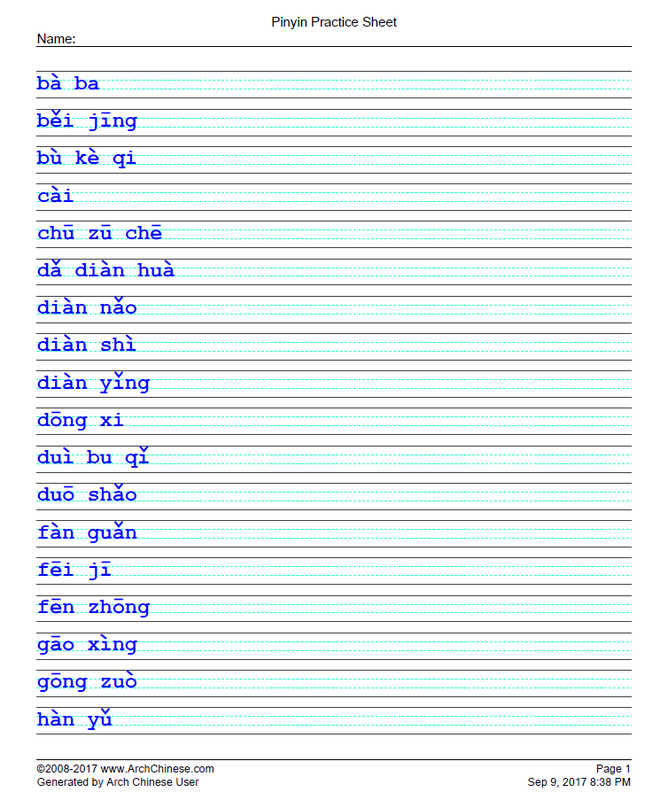 Parts of speech and usage frequency information for all Chinese characters and example words in our Chinese English dictionary. 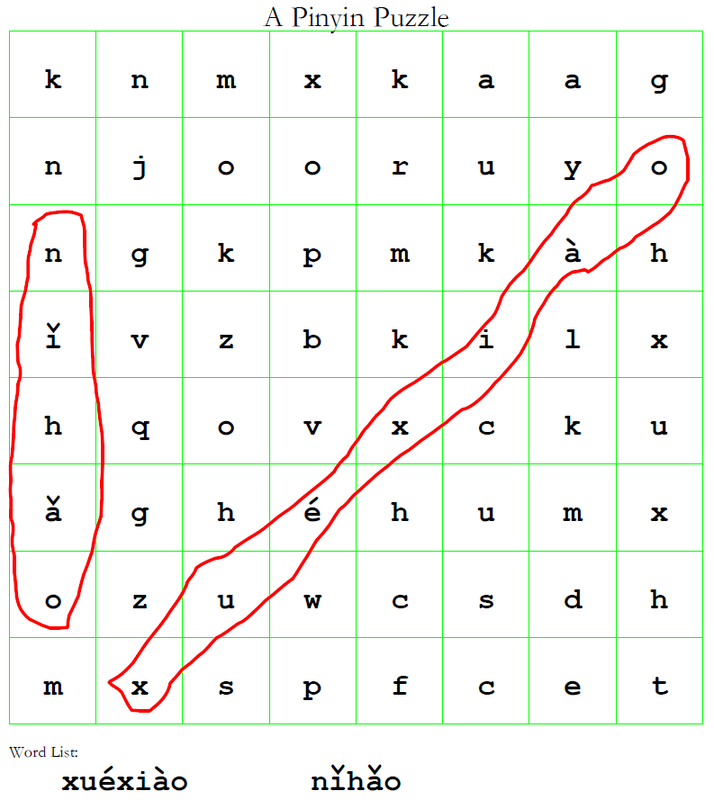 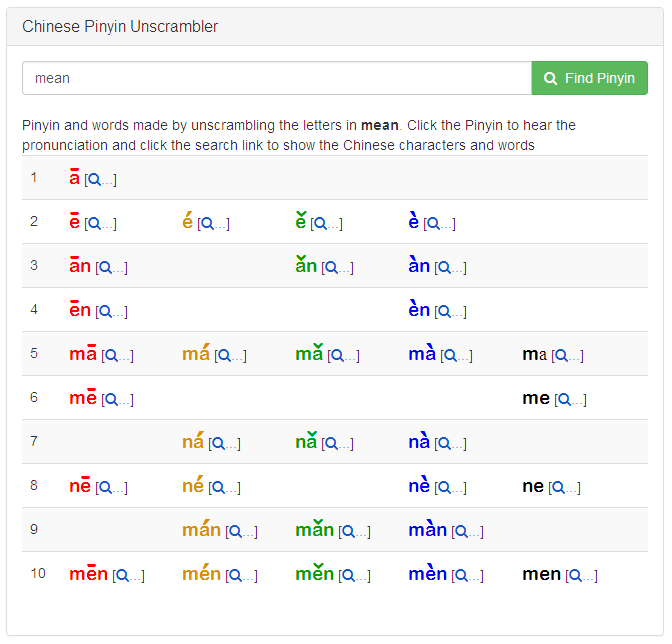 The user can sort the example words by Pinyin, usage frequency, and character count. 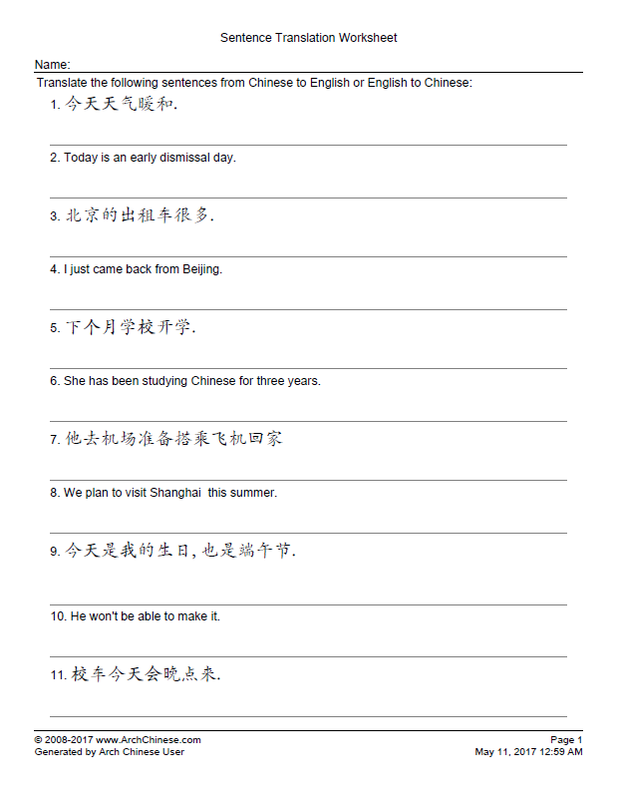 High quality example sentences that demonstrate the typical sentence patterns and the usage of common characters and words. 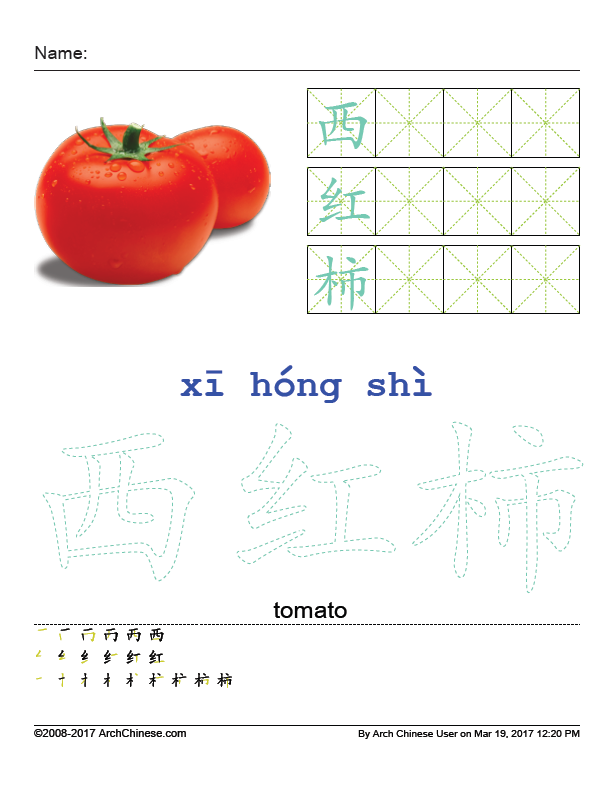 Unlike other dictionaries, our example sentences are created, one by one, by our bi-lingual Mandarin Chinese teachers, not generated by machines! 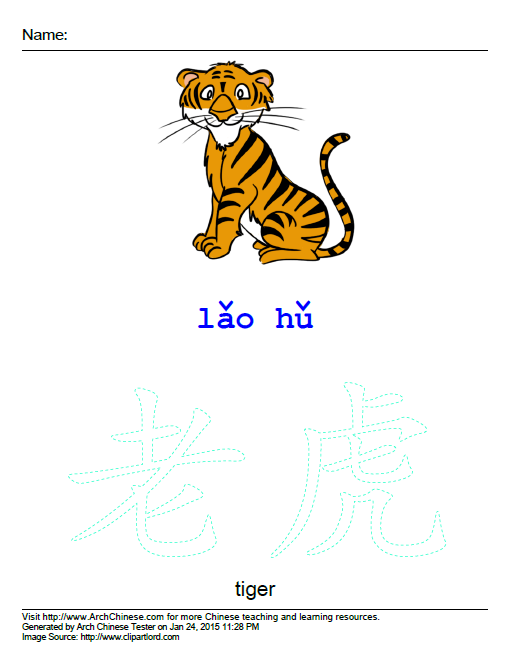 Creating Chinese word, sentence and Pinyin scrambles for use in the classroom or at home. 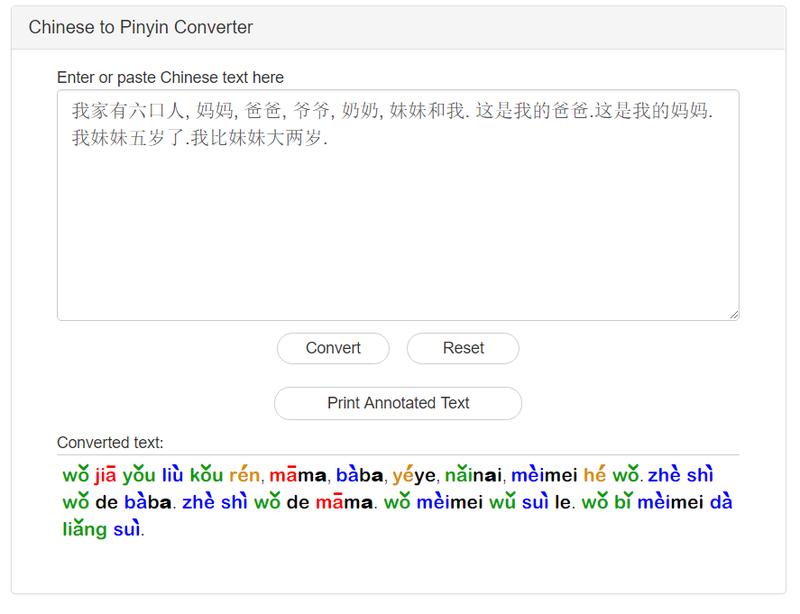 This tool can intelligently detect the words in the sentences and generate the scrambles without breaking the words. 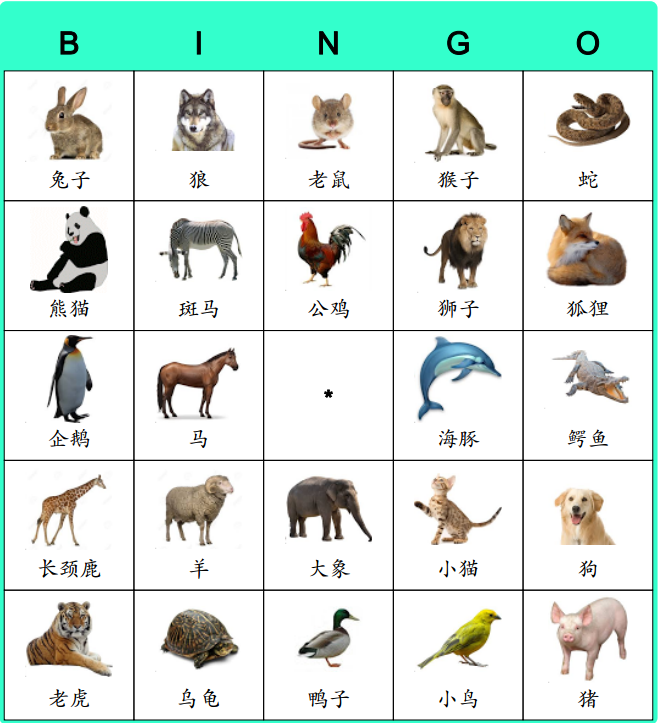 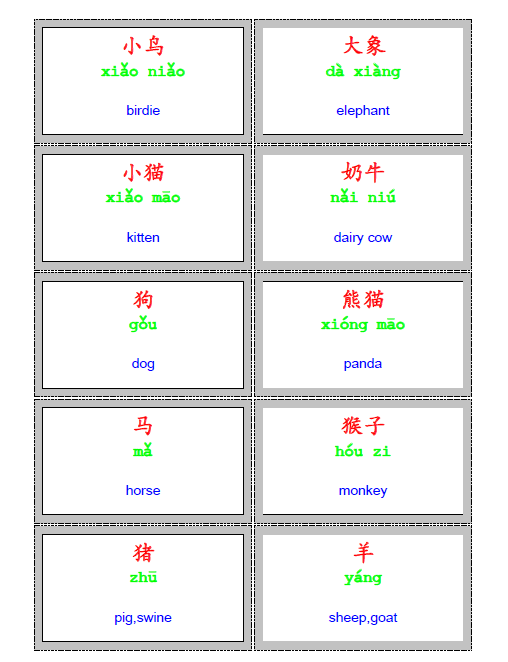 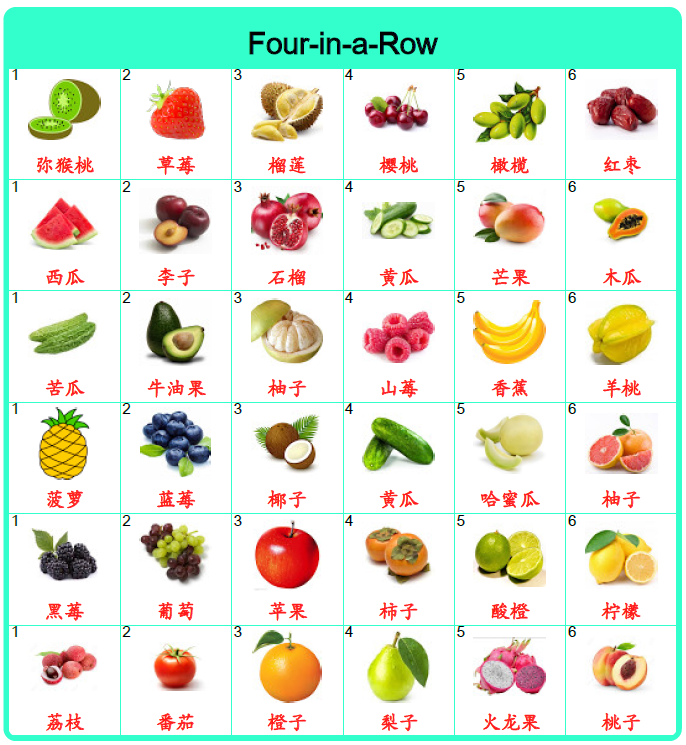 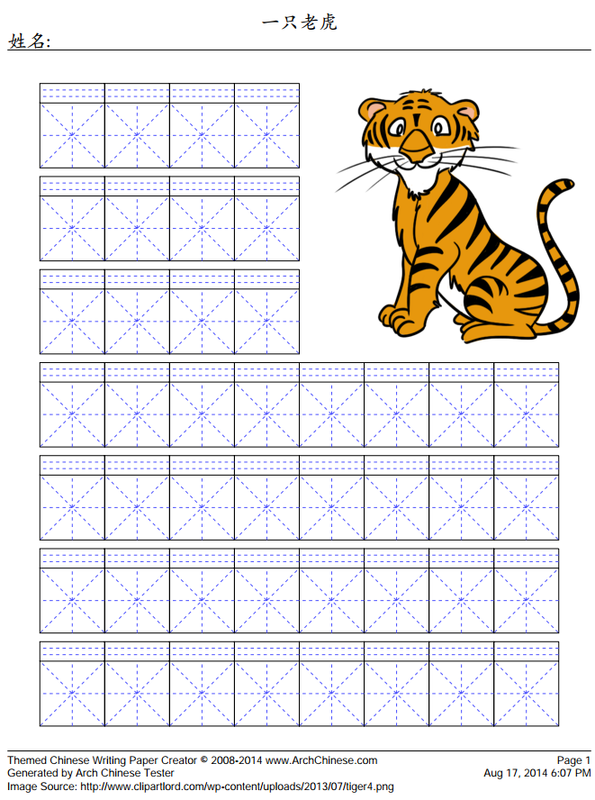 Quickly creating Chinese Word to Picture Matching Worksheets for young learners. 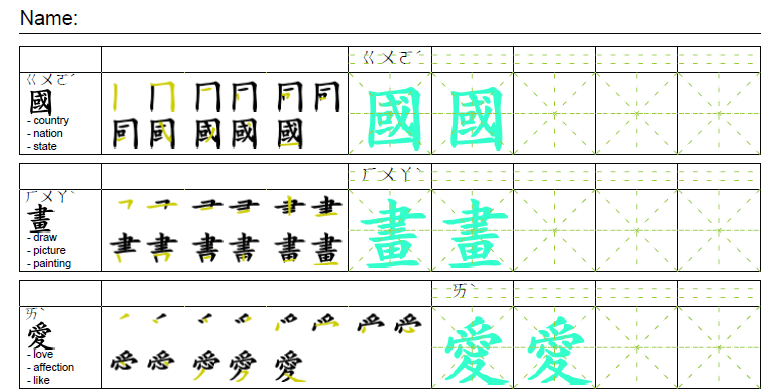 Using Chinese Character Animation Maker to generate embeddable and interactive character animations for both simplified and traditional Chinese characters. 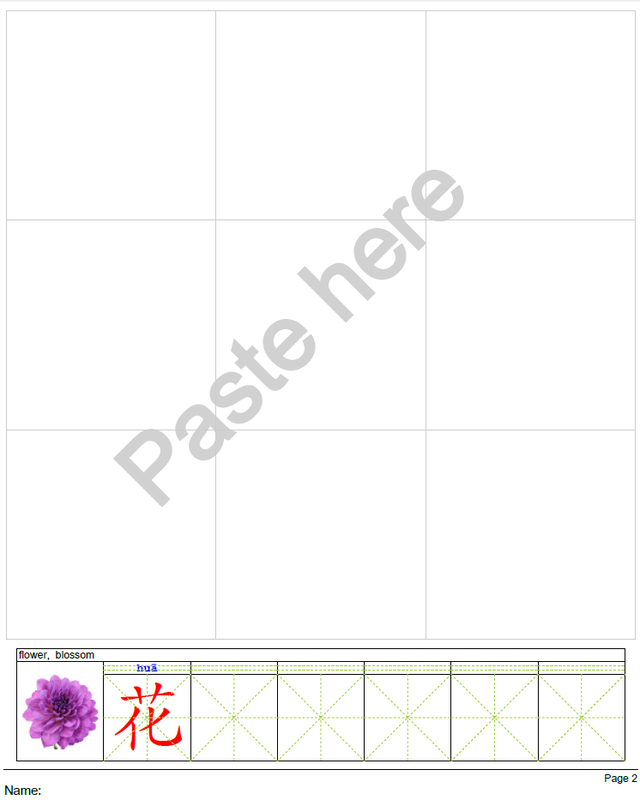 You can seamlessly integrate the animations into your school website, personal web pages or social media. 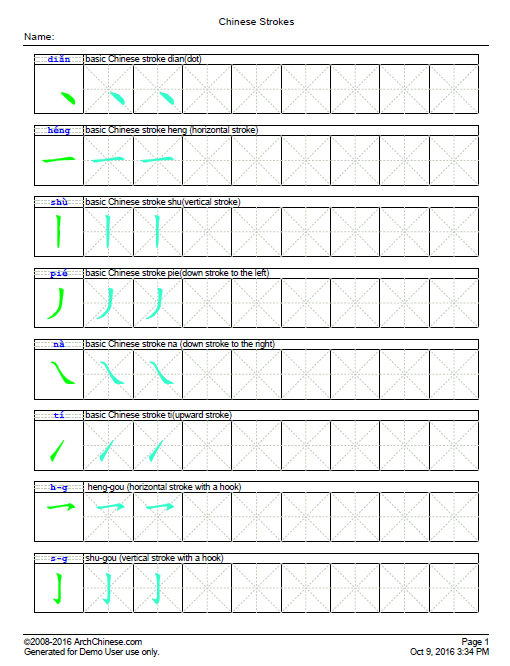 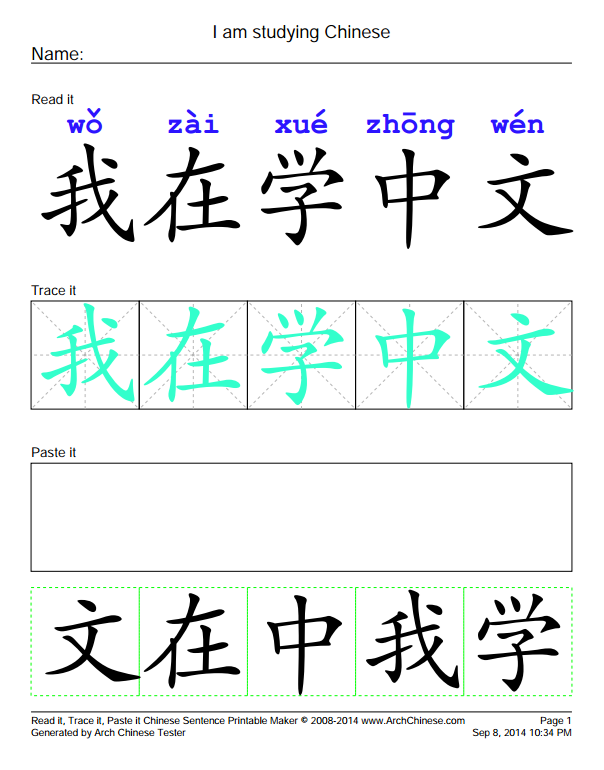 Using Read it, Trace it and Paste it worksheet maker to create great worksheets for young Chinese learners to learn common Chinese characters and Chinese sentence structure. 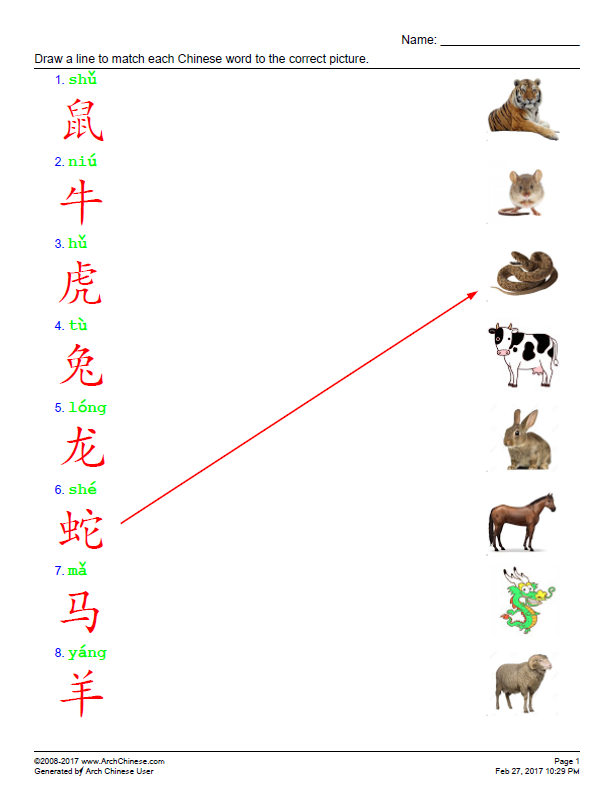 Using our Chinese Character Poster Maker to create stylish Chinese character wall posters with any Chinese characters. 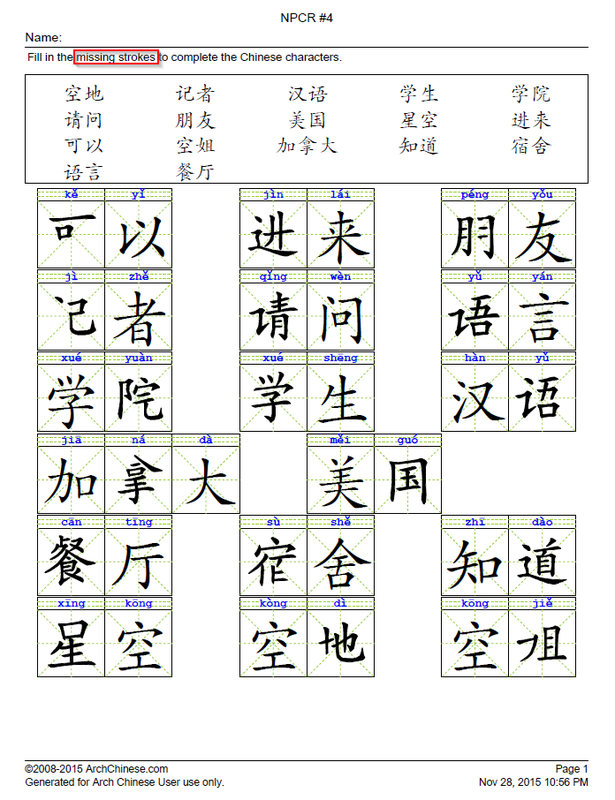 The Chinese character wall posters can be as large as 36 X 48 inch. 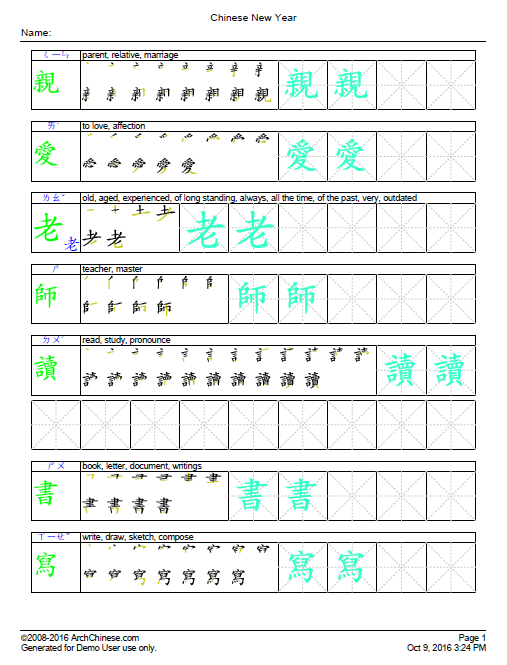 Quickly generating Chinese character coloring sheets for young learners. 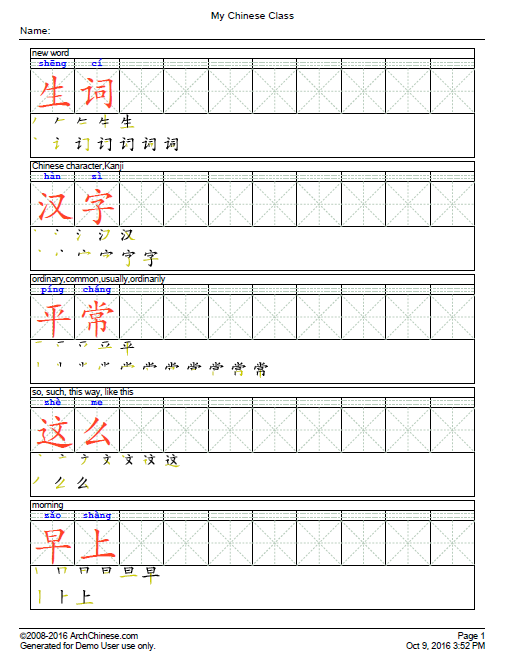 Using Chinese Phrase Dictation Worksheet Maker to create Chinese phrase or sentence dictation sheets for classroom use. 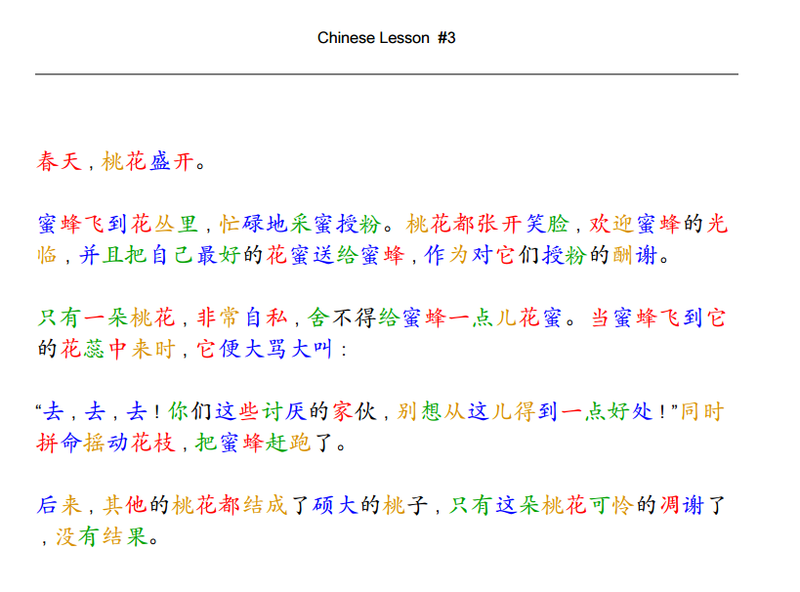 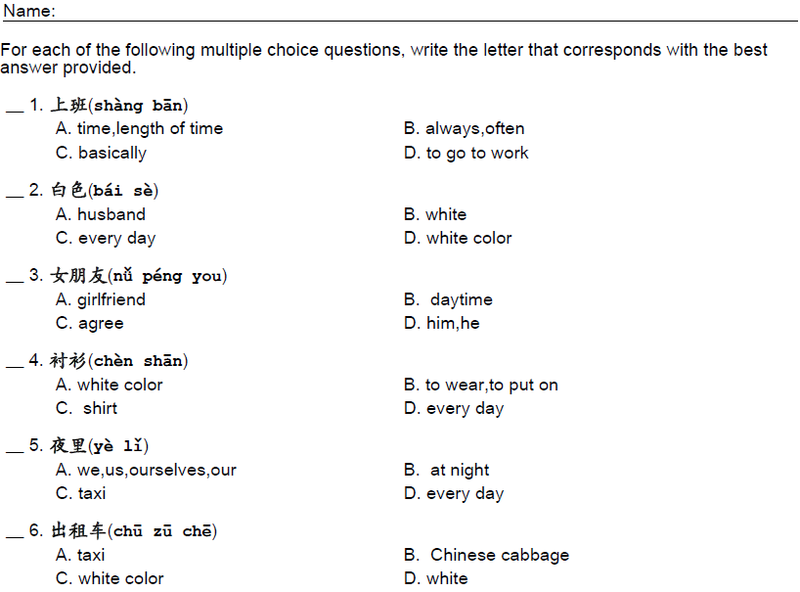 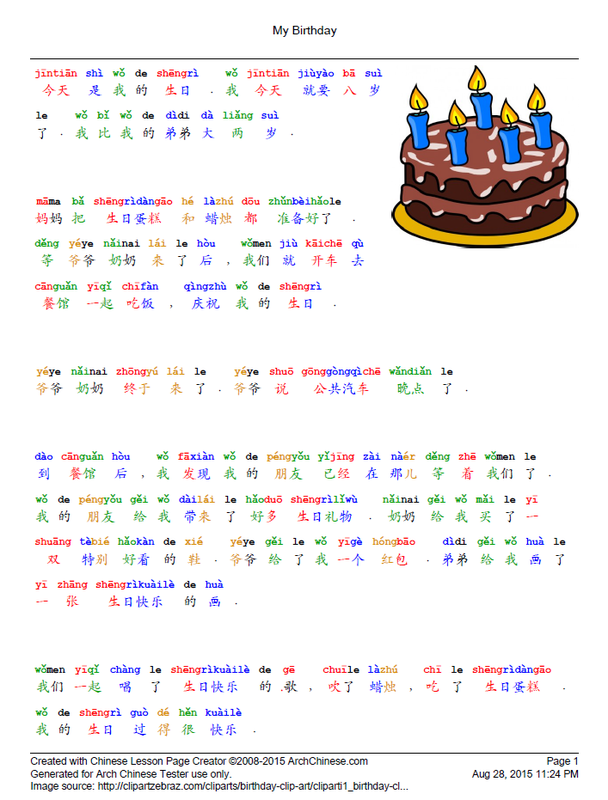 Generating classroom handouts with color coded Chinese text using our Chinese Text Color Coding tool. 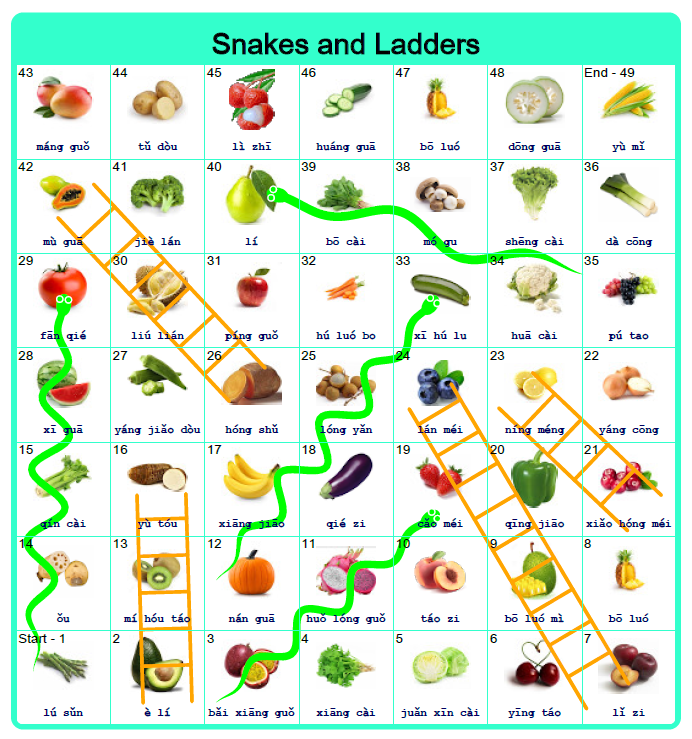 Using Snakes and Ladders Board Game Generator to create a custom Snakes and Ladders board with your words of choice. 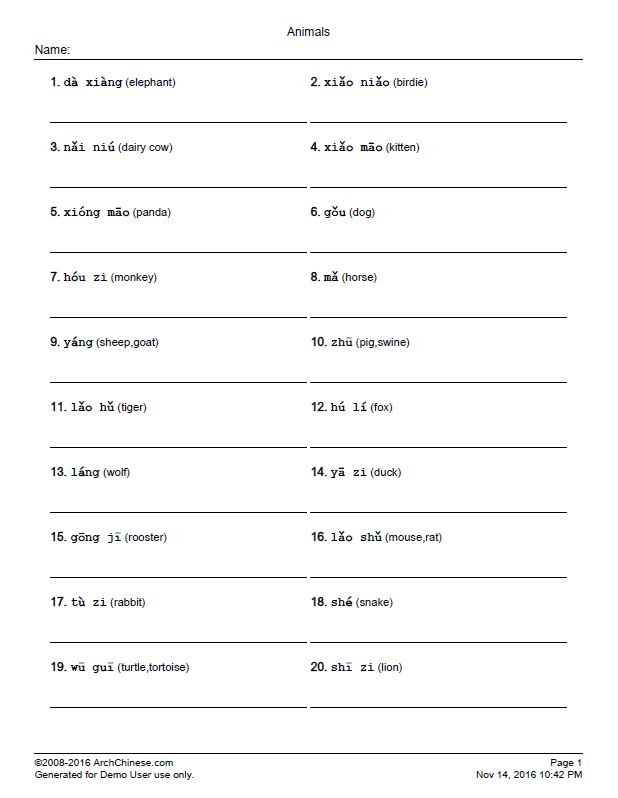 powerful tools to merge, split, rename, move, and delete vocab lists. 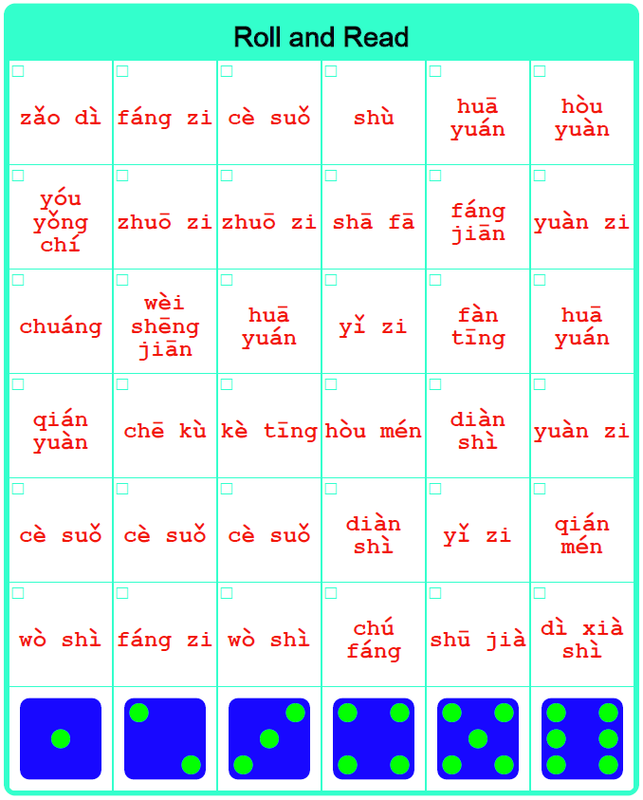 Reading the stroke names of the Chinese characters during the stroke order animations. 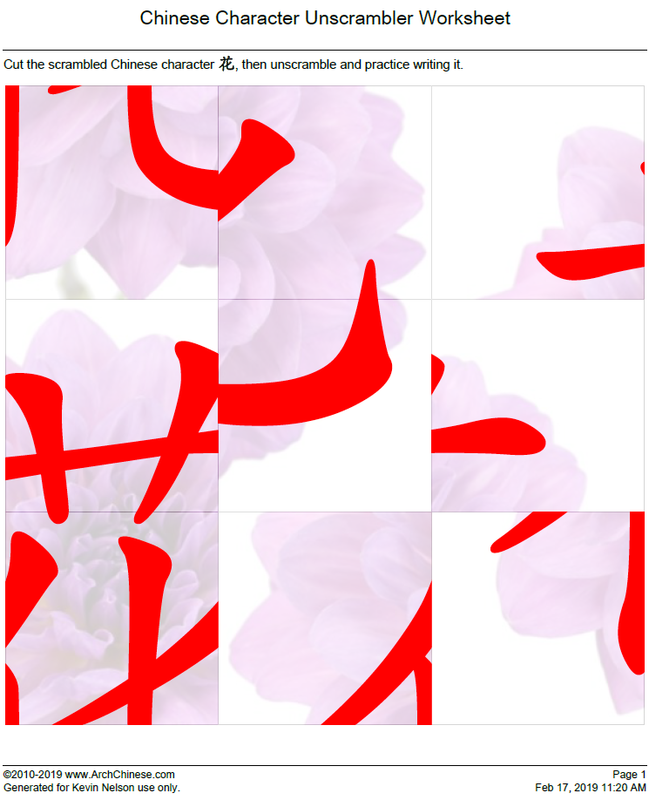 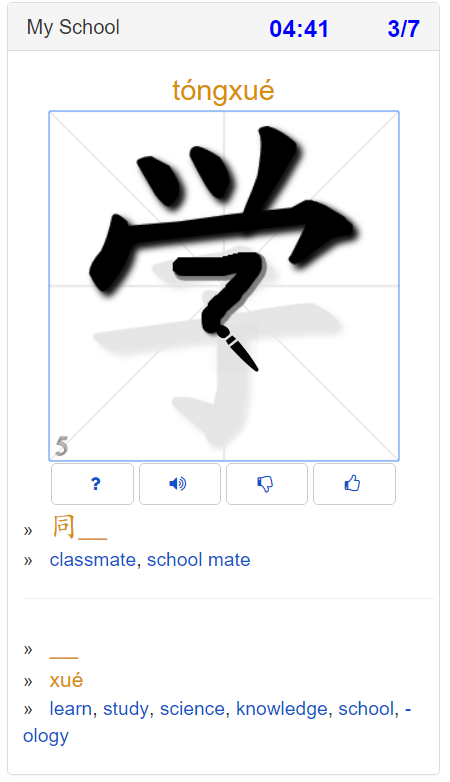 Click the animated Chinese character or the Next Stroke button below the animated Chinese character to hear the native-speaker pronunciation of the strokes of the character. 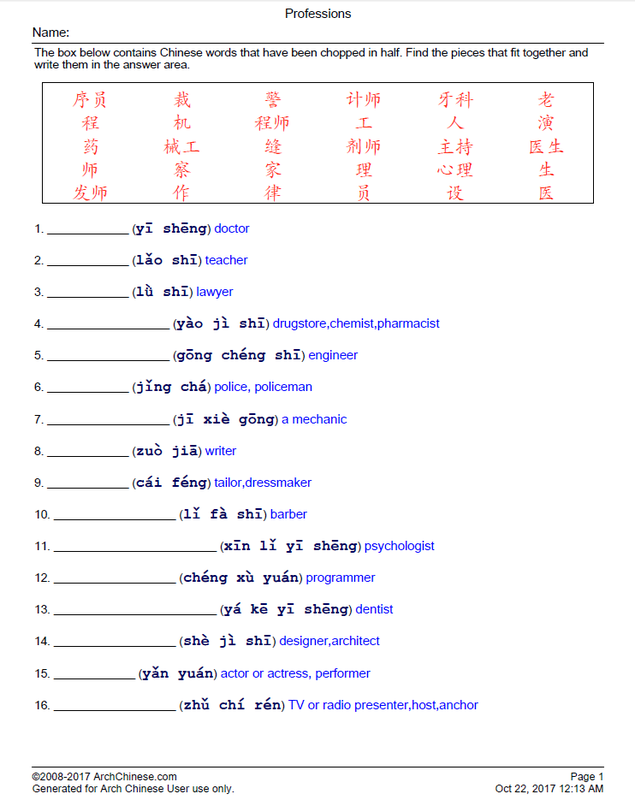 Downloading example sentence MP3 audio files to listen to them on your phone. 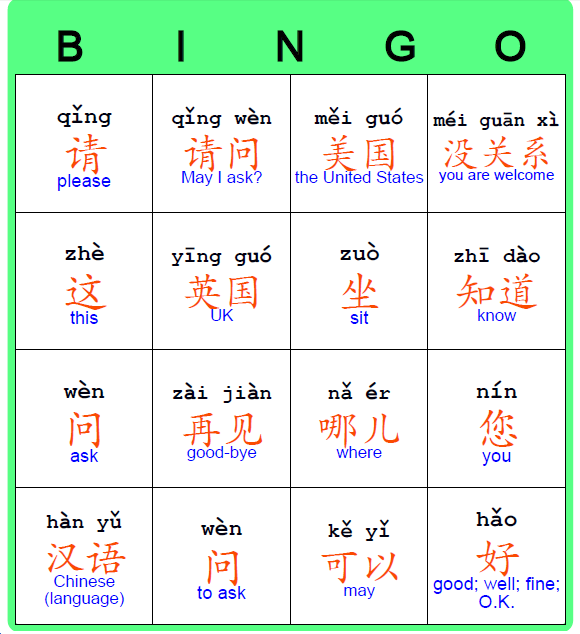 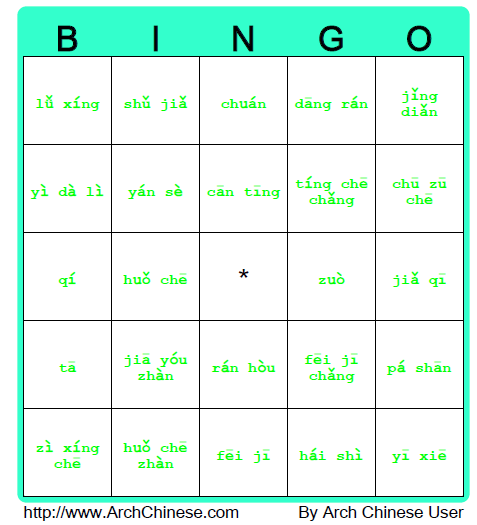 Adding Chinese characters, common words and phrases from the Chinese English dictionary to generate worksheets, Bingo cards and nicely formatted paper flashcards for offline study. 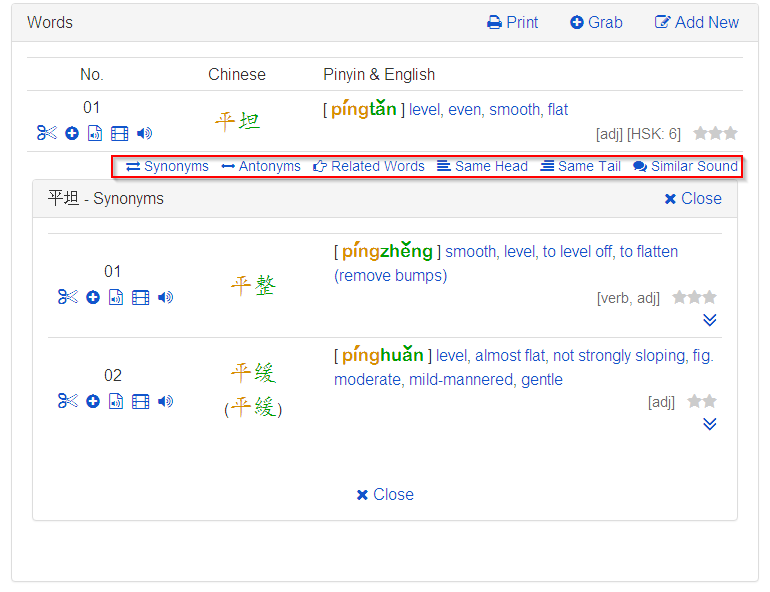 Exporting your vocabulary lists to Excel or CSV files so you are not tied to our system. 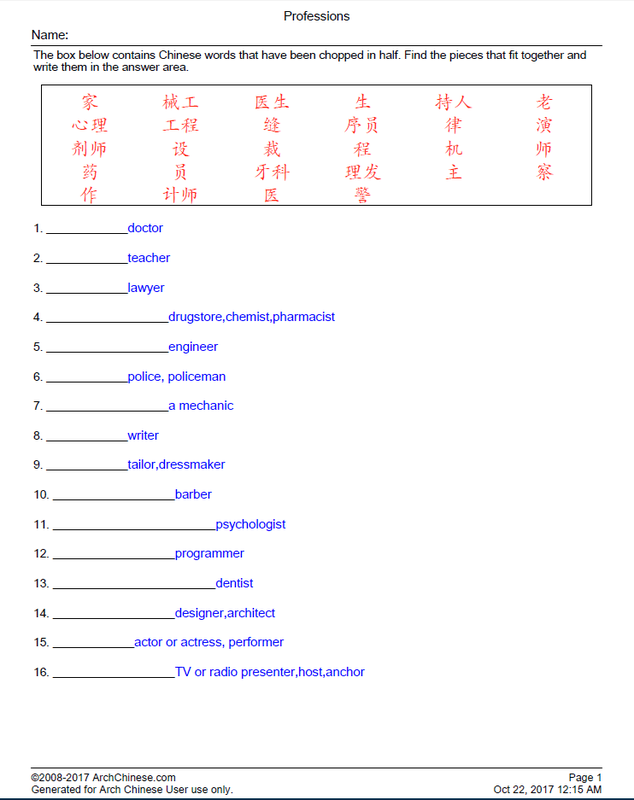 Creating custom vocab lists, post the links on your social media or school web site to share with your students or other Chinese learners. 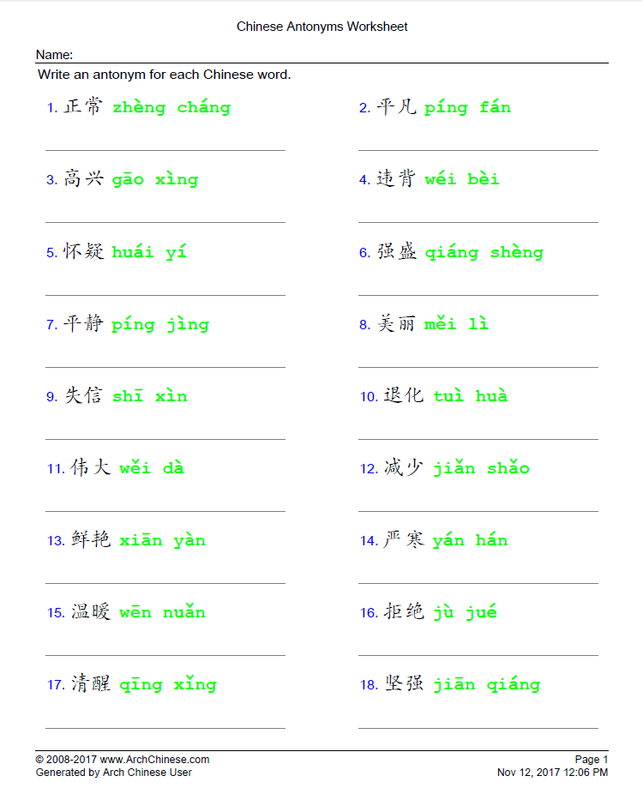 Using Mandarin Chinese Tone Drill tool to practice and test your knowledge of Mandarin Chinese Pinyin and tones. 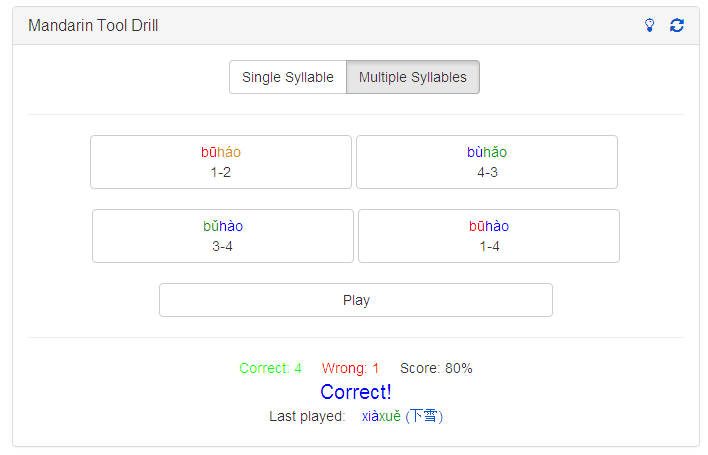 Furthermore, the Chinese Tool Drill (mobile version) can help you learn and practice not only the basic tones of Mandarin, but also Mandarin tone changes (also known as tone sandhi). 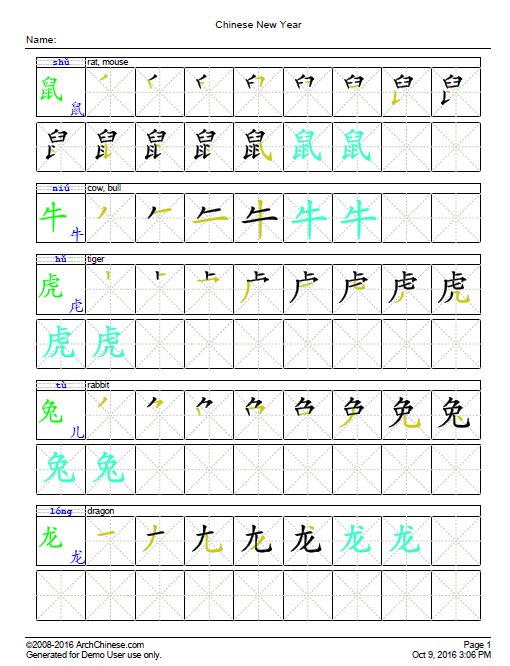 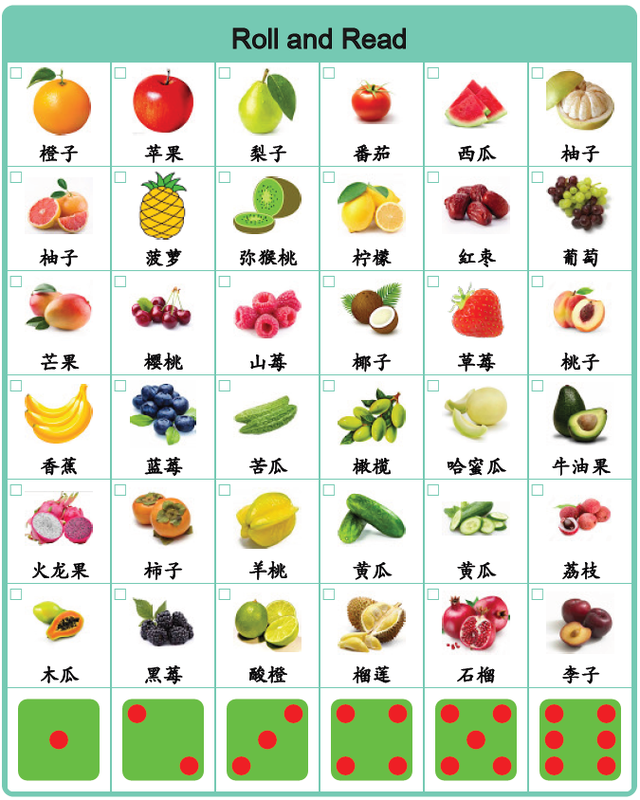 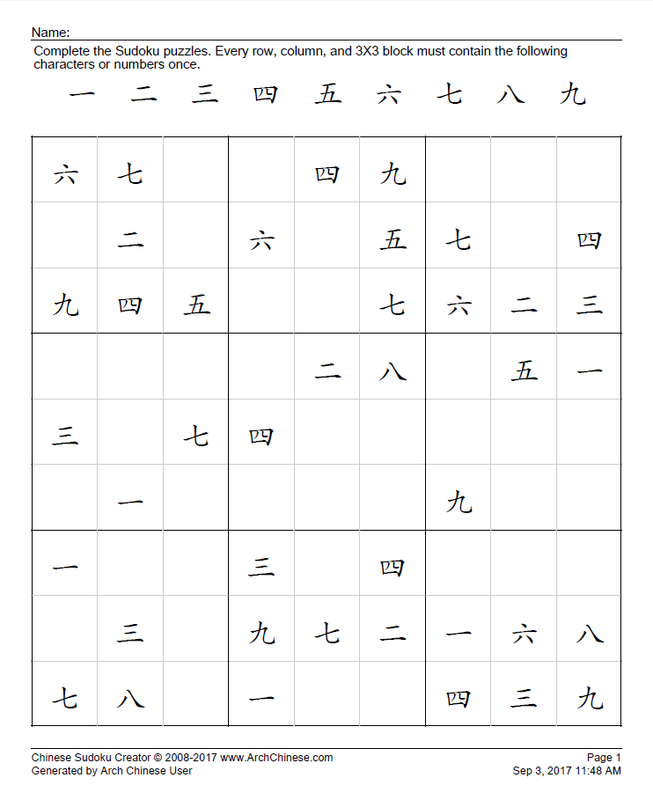 Innovative Chinese Word Worksheet Generator, you can quickly make customized Mandarin Chinese words or sentence worksheets for your classes or children. 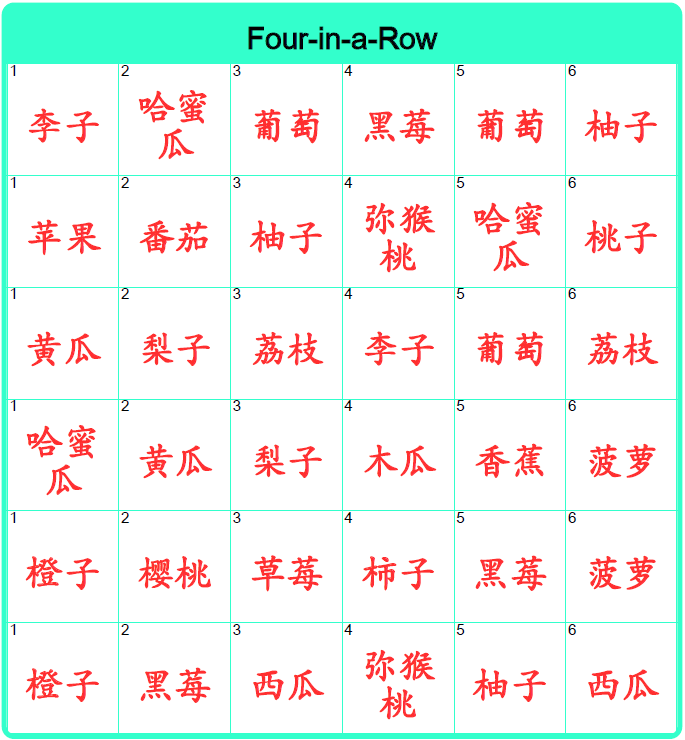 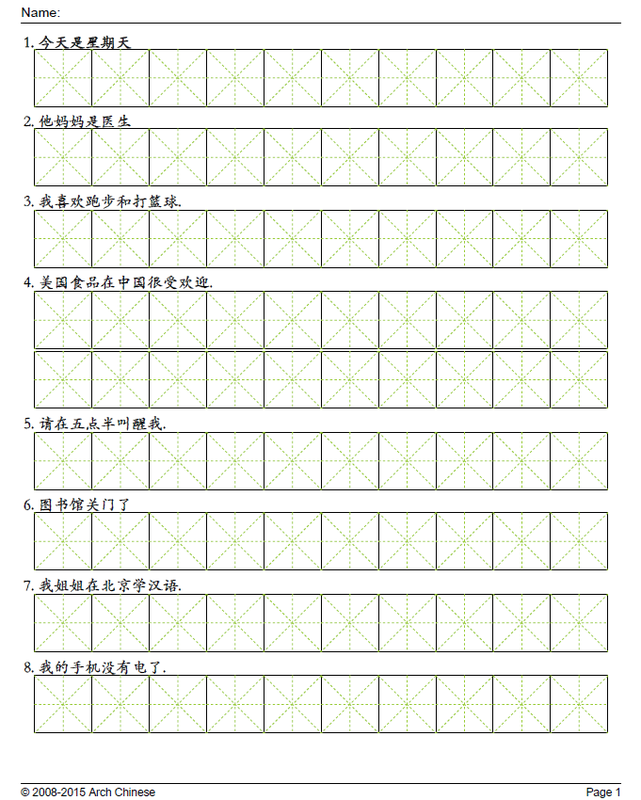 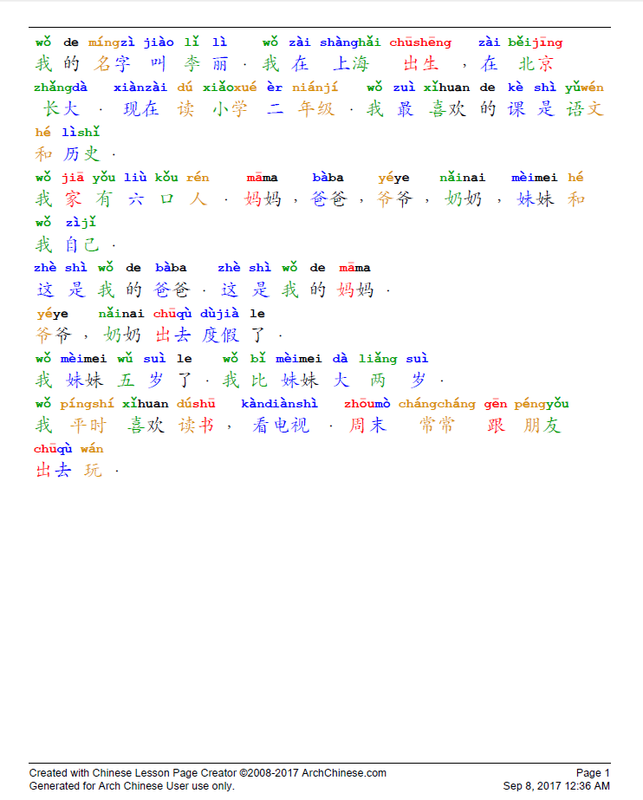 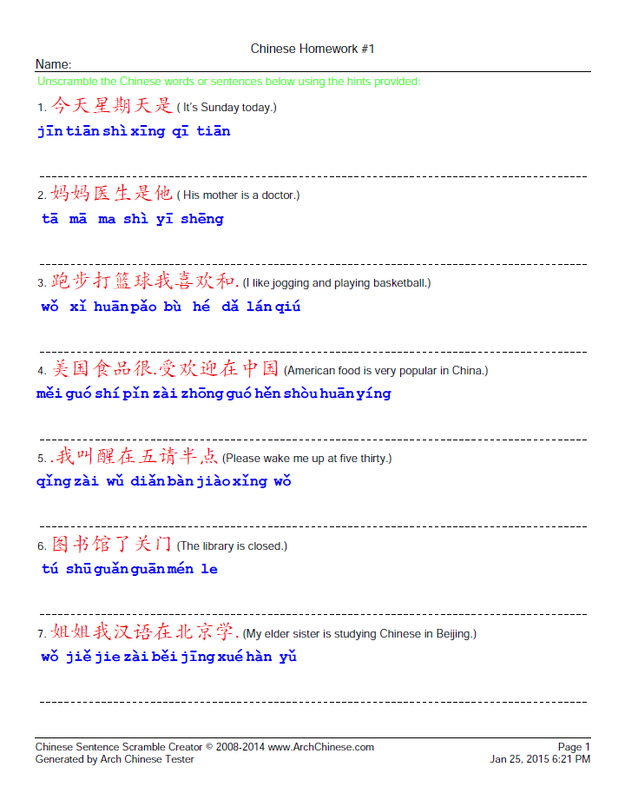 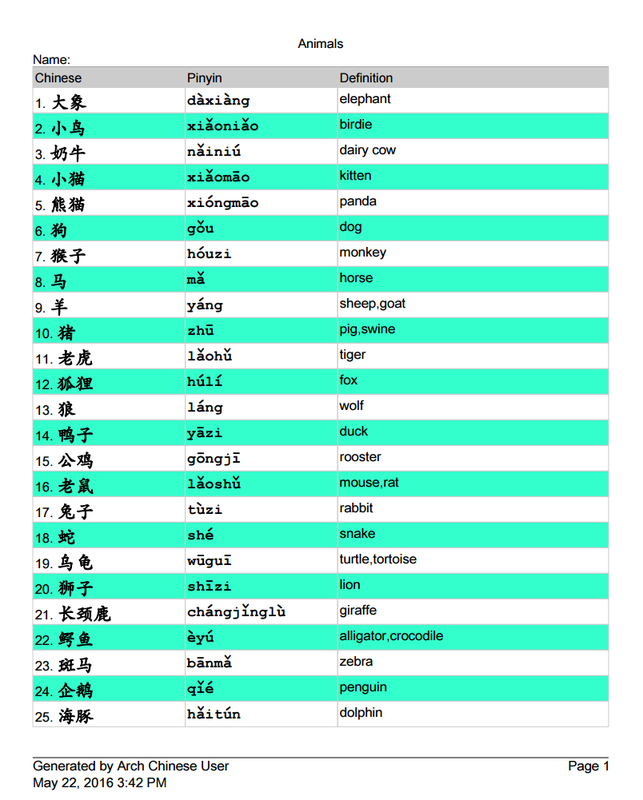 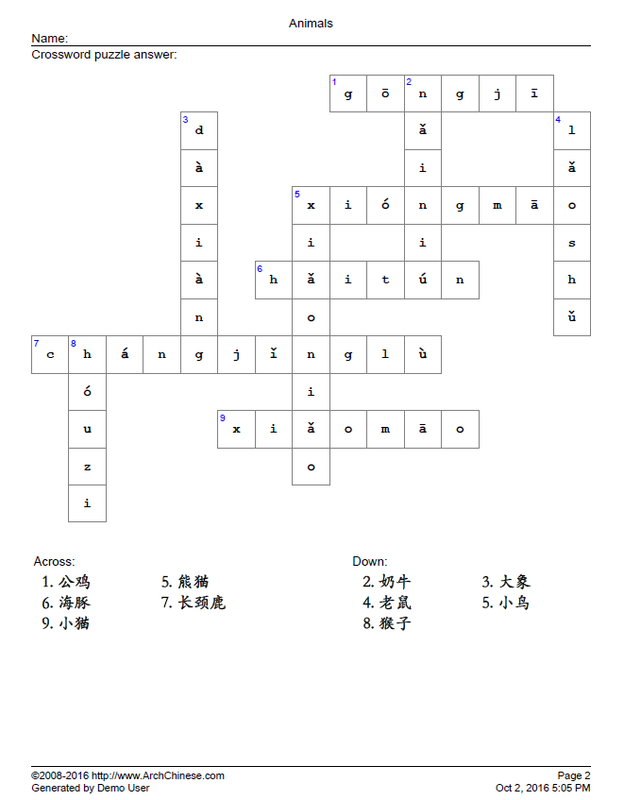 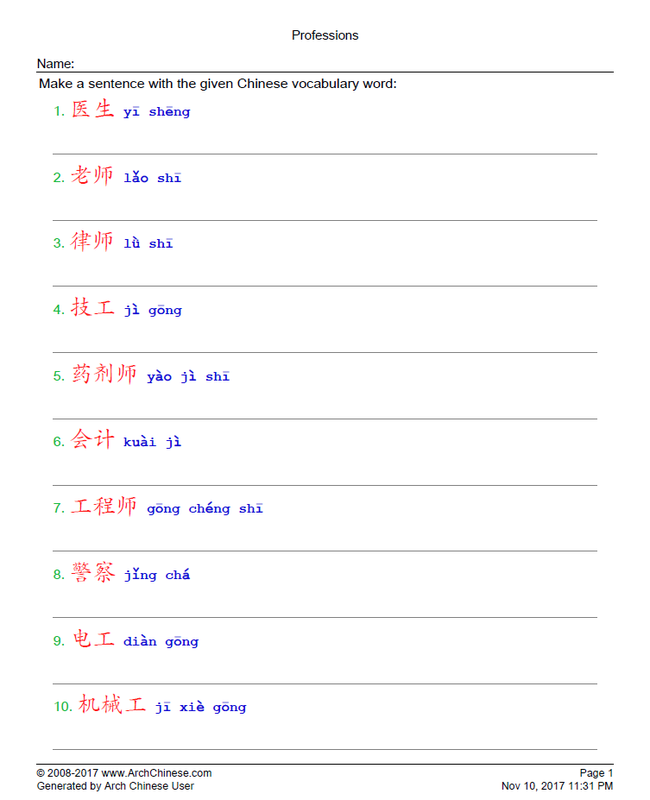 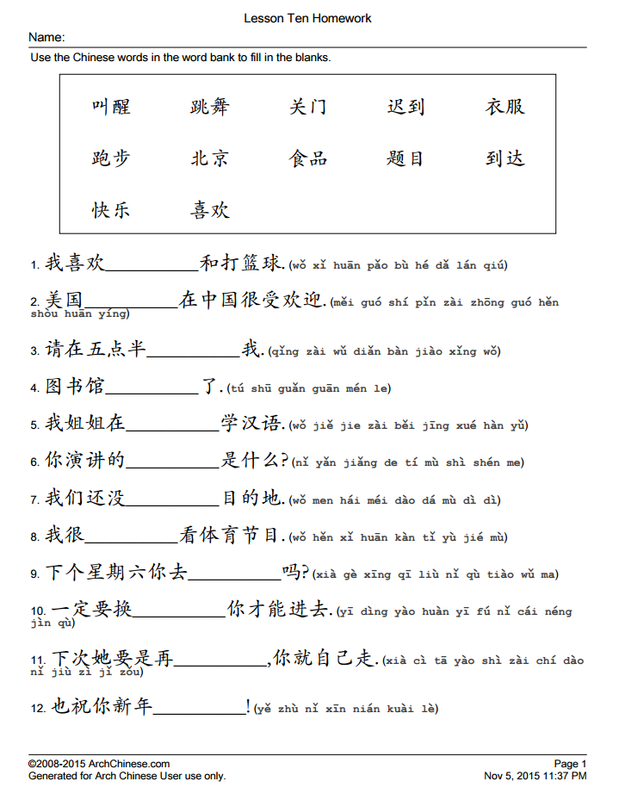 Generate Chinese sentence making worksheets using our Sentence Making Worksheet Creator. 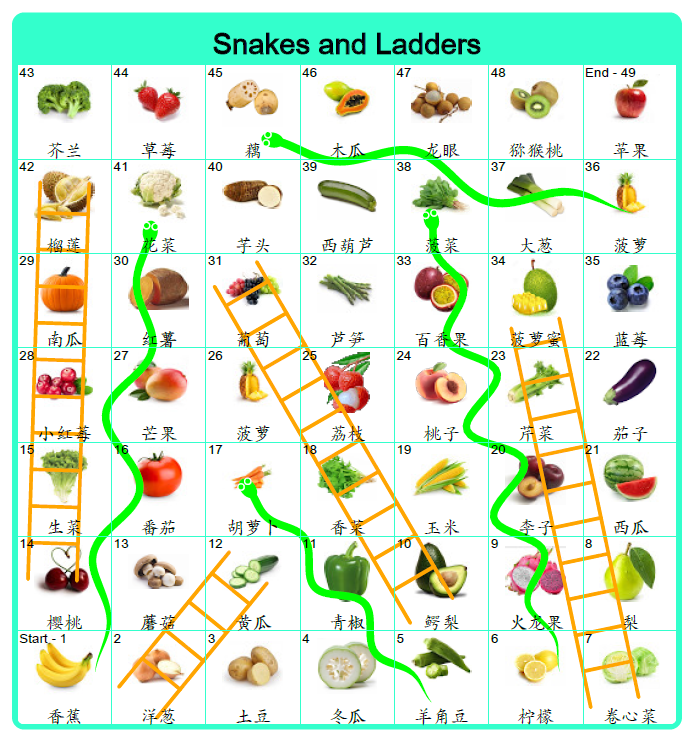 Many Chinese language learners and teaching professionals have found this system useful and effective. 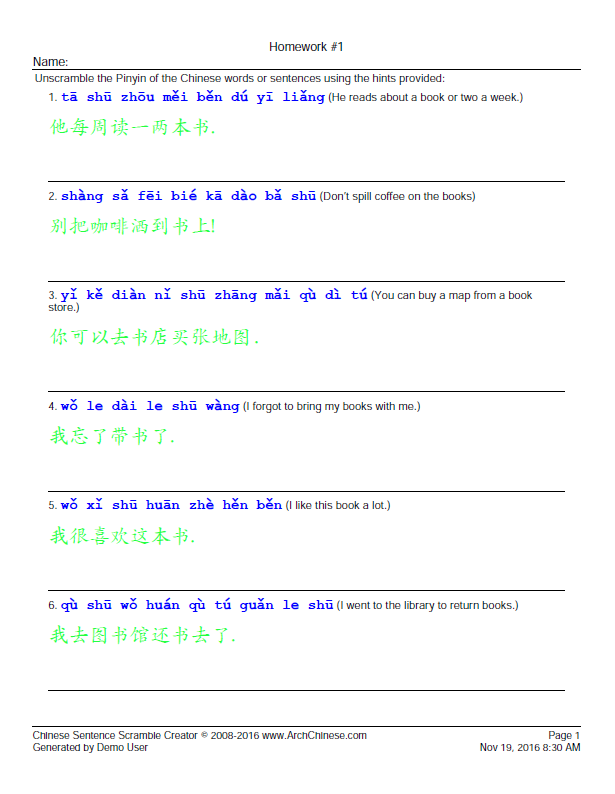 Read what some of our users and teaching professionals have said about us on the User Testimonials page. 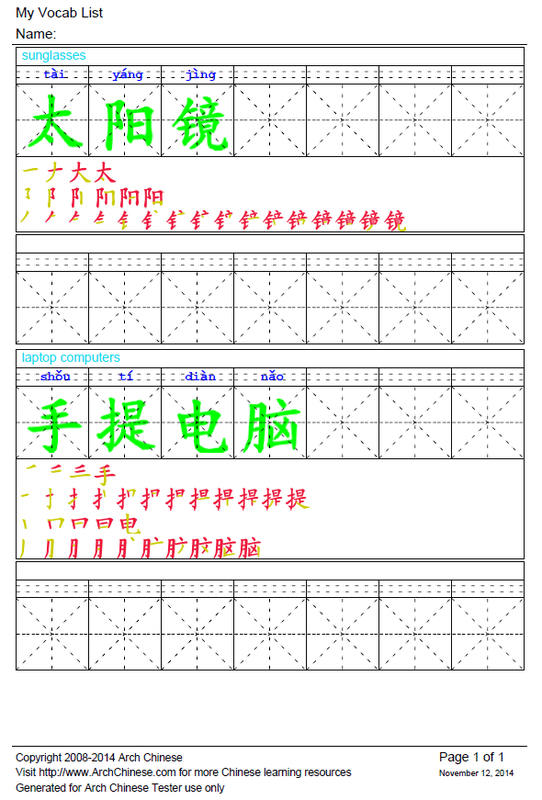 As one user said, this system literally serves as a free 24-hour-a-day tutor. 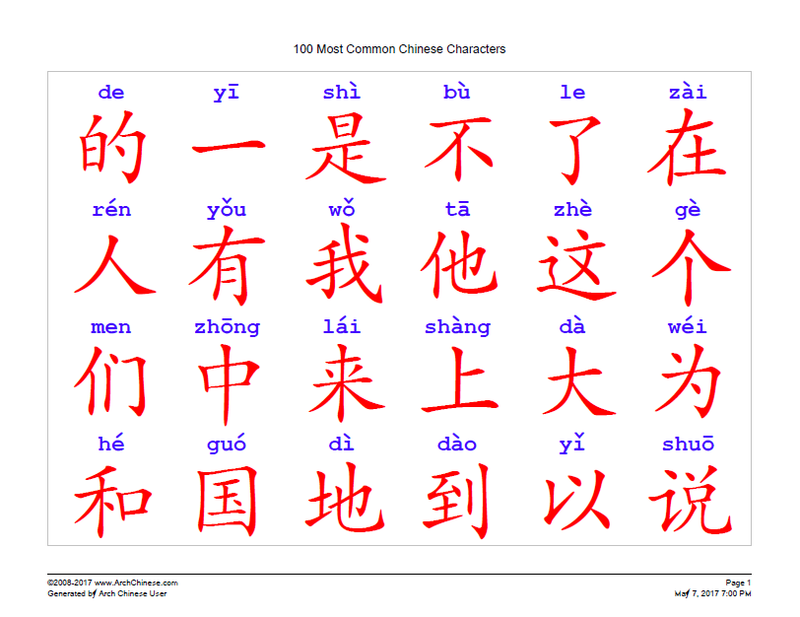 Sign up now and learn Chinese characters with this 24-hour-a-day Chinese tutor today!